90+% of people will answer: no. The question is: Are you 100% confident that you, your team and your audience know the 1 thing that makes your business grow — your “x” factor? 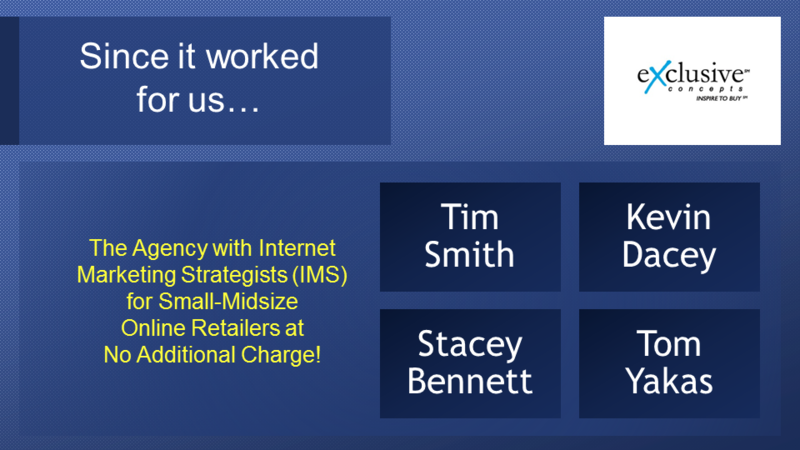 If you answered “no” and you are an online retailer, then this is one of the most important webinars you will ever watch. A. 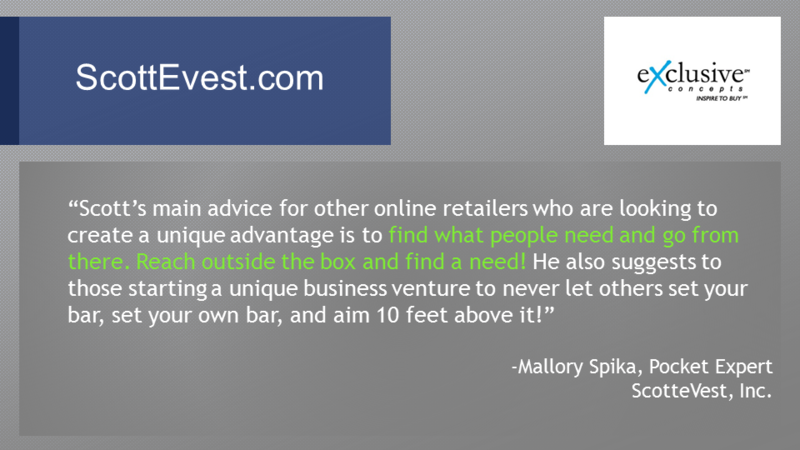 Make sure you hear about companies that are doing what they said you could never do in online retail. B. Share years of online retail strategy advice that has helped our clients stay at the cutting edge of a tumultuous, volatile, competition-attracting industry for almost 2 decades. This will absolutely affect your strategic planning process: If you don’t know what it means to create an x-factor for your business, you’ll learn it here. It’s a concept that we have embraced time-and-time-again to help our online retail clients reach out from the plateau points of 7-figure or 8-figure annual revenue and start preparing for their ultimate challenge of becoming the absolute leader in their space. 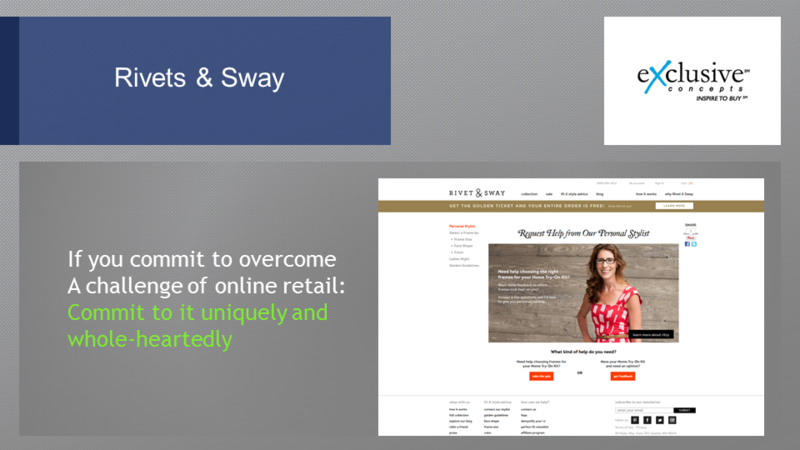 Examples inspire: Part of the webinar will cover the one thing that 25 different online retailers are doing to challenge the status quo, on their own; changing the online retail world as we know it. They include: Amazon.com, Staples.com, IndoChino.com, BlueCotton.com, BucketFeet.com, GreatsBrand.com, LillyPulitzer.com, ScotteVest.com, ShopPlanetBlue.com, ChronicleBooks.com, Alibris.com, BourbonandBoots.com, CappellosGlutenFree.com, TheTieBar.com, DollarShaveClub.com, NYXCosmetics.com, Blinds.com, UrbanGirl.com, Kershaw.com, Glasses.com, PetFlow.com, and RivetsandSway.com. 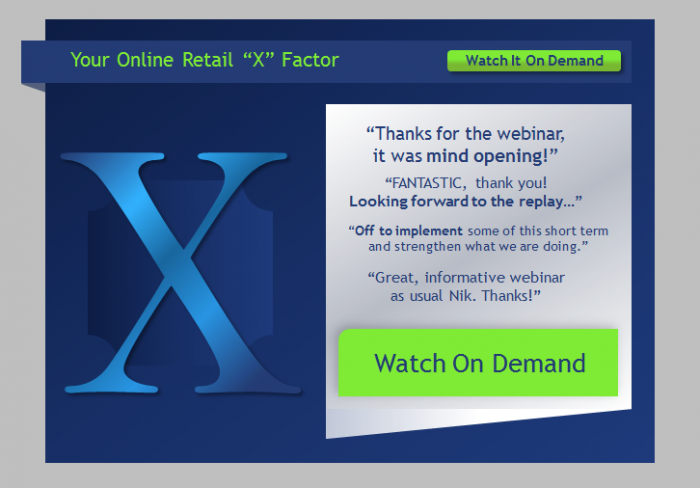 Hi folks and welcome to the recorded version of the X Factor webinar. 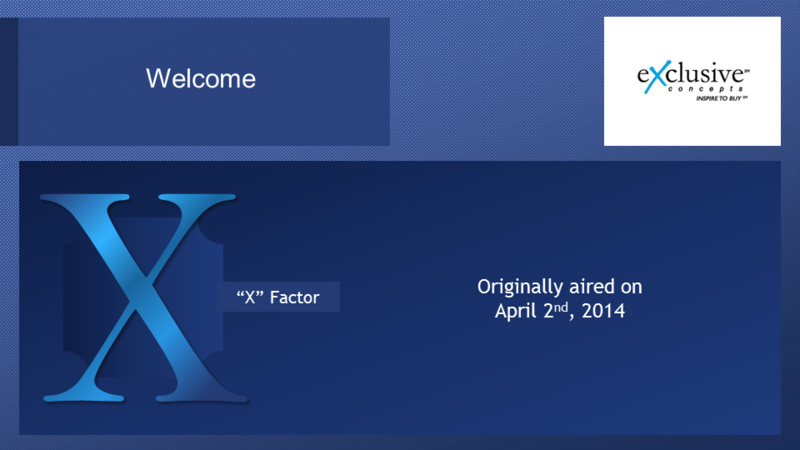 It was originally aired on April 2nd, 2014. 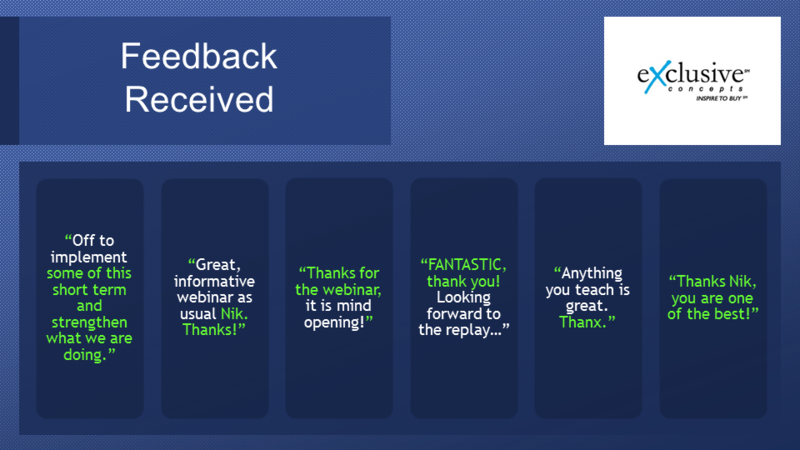 For starters, we want you to understand what kind of results we had from the original airing of this webinar. It will give you some expectation of what you’ll be able to achieve for yourself by following this webinar. 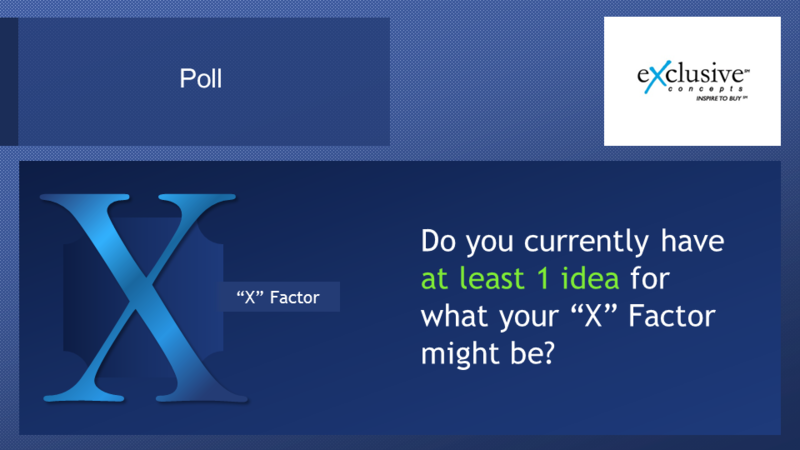 At the beginning portion of the webinar we asked all attendees who currently have at least an idea for what your X factor might be. 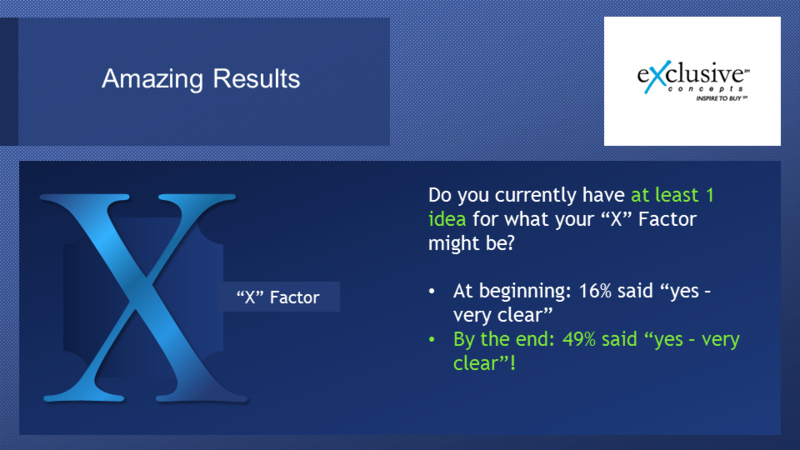 This was after we explained what an X factor was, and at the beginning, 16 percent of attendees said “yes.” By the end, we did the poll once again and 49 percent of business owners that were on the call said yes, very clear about what their X factor is. We received incredibly positive feedback as well. 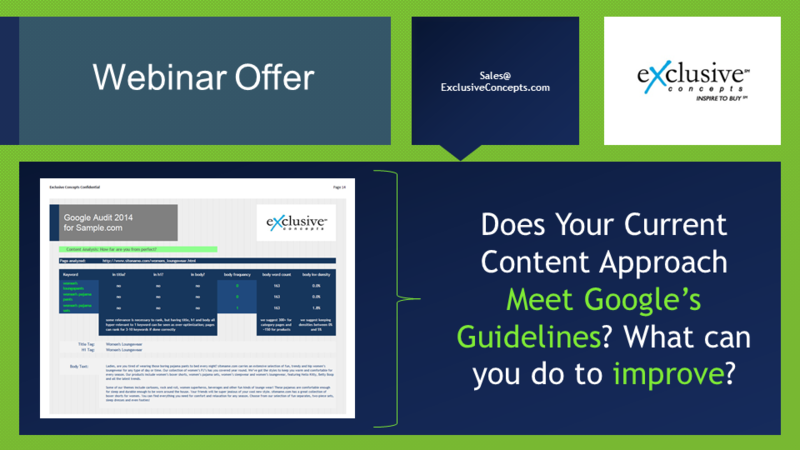 We ask that you read this to get a sense of what you might expect from this webinar. This was unsolicited feedback. 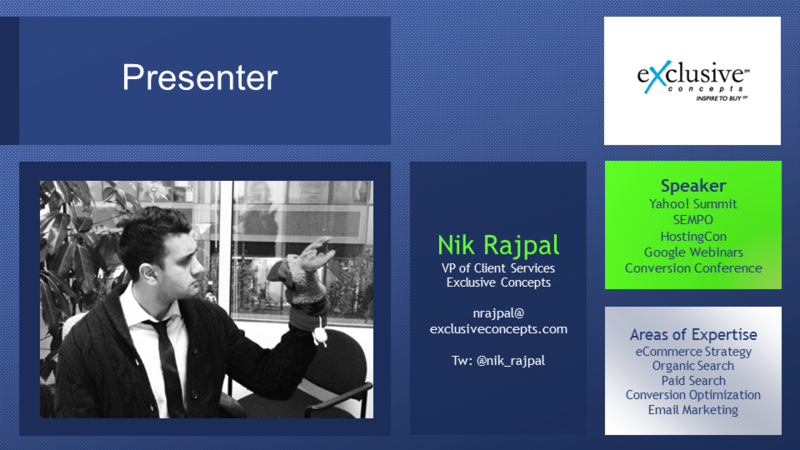 Okay and quick introduction, my name is Nik Rajpal. I’m the VP of Client Services here at Exclusive Concepts. My email address is nrajpal@exclusiveconcepts.com. You could follow me on Twitter @nik_rajpal, Nik Rajpal. I’ve been a speaker at Yahoo! 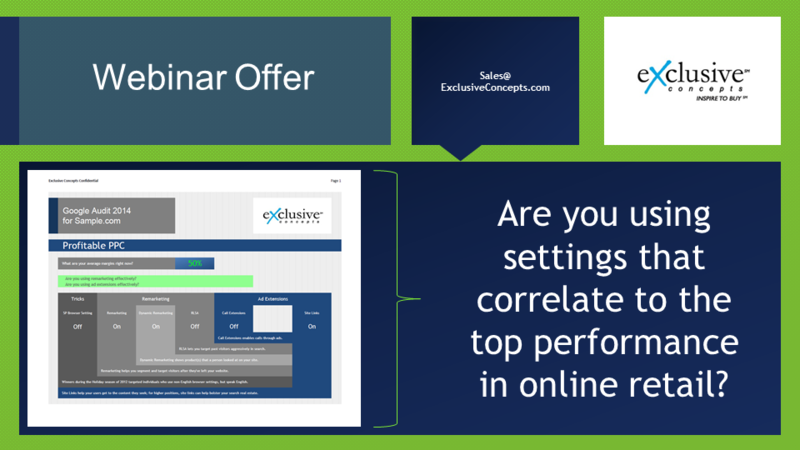 Summit, SEMPO, HostingCon, webinars with Google, Conversion Conference. My areas of expertise are ecommerce strategy as we’re going to be discussing today, organic search, paid search, conversion optimization and email marketing. Who are we? I’ll do a very quick introduction because it will make more sense as we discuss. 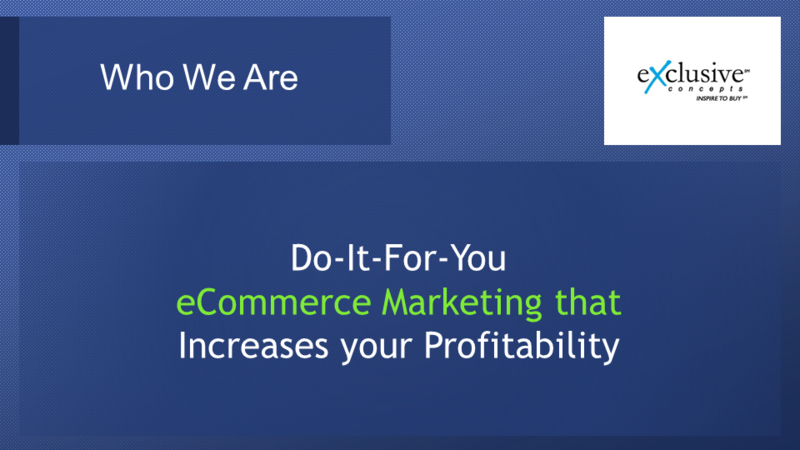 We are a do-it-for-you ecommerce marketing service provider and we offer do-it-for-you ecommerce marketing that increases your profitability. 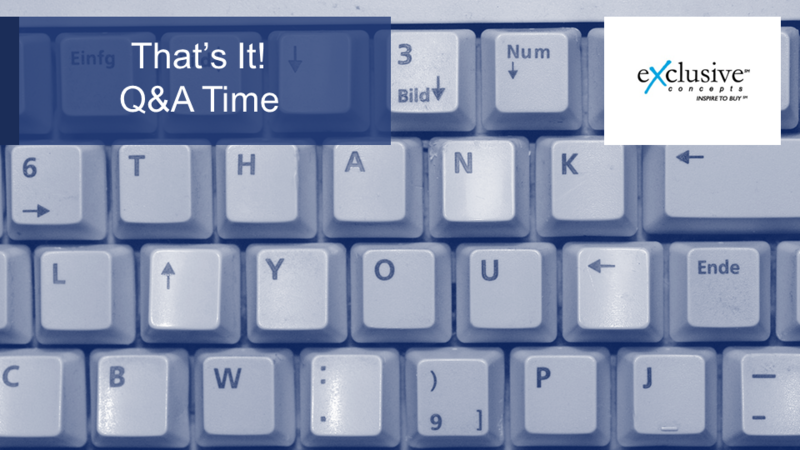 Quick agenda: When we did this live by the way we encouraged people to sign up to our future webinars because our live version always has a live QA after we’re done with the presentation. 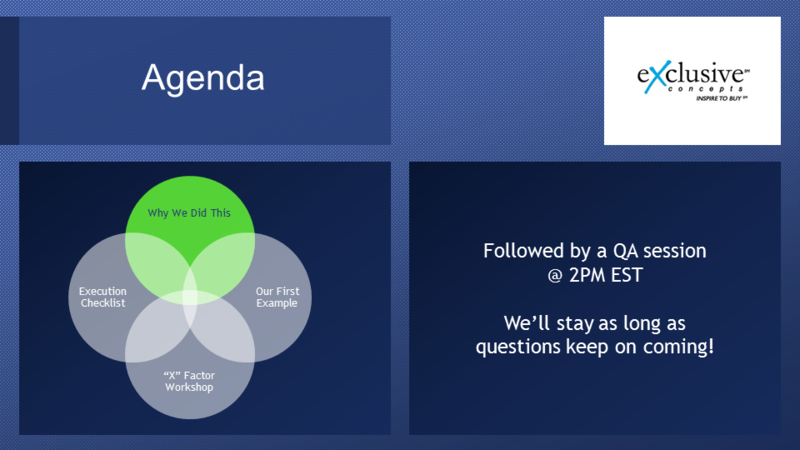 We’re going to first talk about why we did this, why we created this webinar. Let’s start with our first example, then we’re going to do a full X factor workshop. 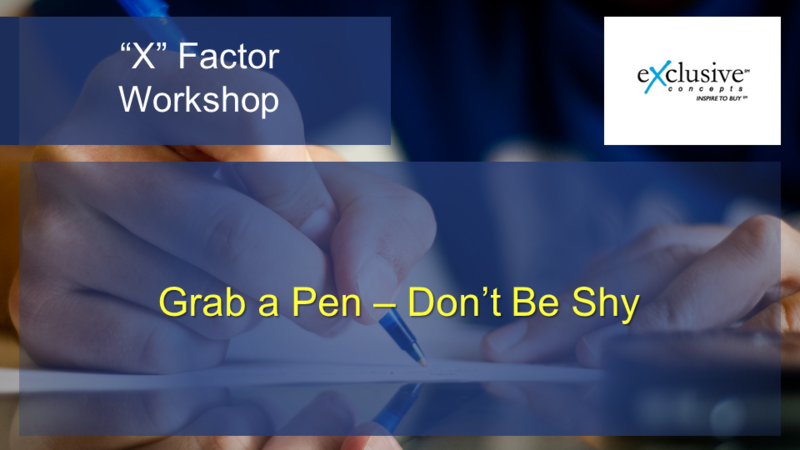 This is where people are generating ideas for their own business where you’ll be able to identify, potentially, at least one new idea of what your business’ X factor can be and how you can continuously grow with a little more ease. Then we’ll review an execution checklist. We’re inspired by a lot of different people. Ken Estridge, who was quoted here, “Strategy is how you plan to win.” Ken is our adviser at our company. He helps us be more objective about the opportunity that we have here at Exclusive Concepts to grow and we believe that every business should have an adviser, an outside, objective, empirical adviser. Someone who can say, “You know, what I actually see is this. You guys may be a little bit too close to it to see.” I’m going to bring up some quotes from Ken throughout this presentation. I think Ken really sums it up best when he says “Strategy is how you plan to win.” Strategy is all about whether or not you can win and if your strategy is good enough then you believe you can win. Let’s start off with why we did this. The point that we wanted to make, and you will realize this as you go through, is that growth is not insurmountable. We speak with business owners all the time and people are going through a lot of difficult things, especially since the beginning of 2011 when Panda came out and a lot of change has happened in the marketplace, and what we hear is we’ve tried. We have all the passion in the world for our business. We’ve poured investment into our business but the obstacles are too big. They’re kind of Google’s random changes and competition like Amazon. We want to bring some form of a reality check here, guys. First of all, the online retail sector is growing and the economy is growing as well. The economy grew 2.8 percent in 2013. 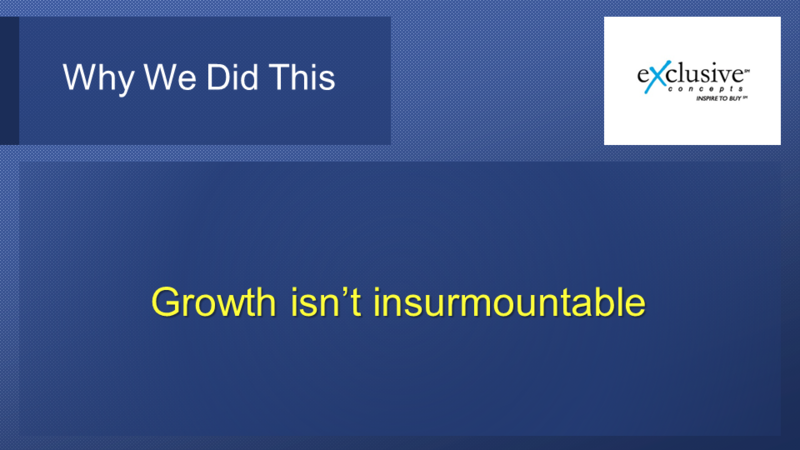 If you can’t grow at least to 2.8 percent you’re not keeping up with the economy and, if you’re on online retail, your growth should be much higher than that. You can blame Google’s changes all you want to but you know what? That’s your agency’s job. Your agency is supposed to figure out how to deal with Google so, for those of you who don’t have a good agency, consider working with us because we can help you figure that out. That’s not something that you should have as an insurmountable challenge in your equation of success. It should be incredibly doable. Most importantly, we hear that Amazon is entering my space, Walmart is entering my space, all these big players, people are getting more sophisticated, there’s too much competition. To that we say: You need an X factor and that is where you can start changing the entire future outcome of your business. It’s one of the most important things that any business can possibly have. It is probably the reason you will succeed. 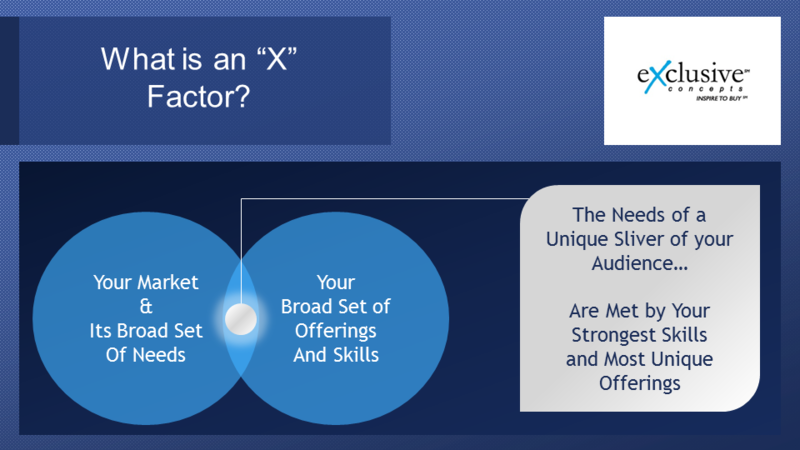 What Is an “X” Factor? What is an X factor? You’re probably thinking about your competitive advantage all the time. This is quite a bit deeper. You have your market and your market has a broad set of needs and then you have your broad set of offering and skills. What an X factor is is kind of a sweet spot where the unique needs of a small sliver of your audience, just a small portion of your broader audience has very unique needs, and it just happens to be that you have the exact skills or offerings to meet those needs. It is going much narrower and much deeper with a particular market, deeper than any one of your competitors are willing to go for that unique sliver of your audience. Let me demonstrate through a quick example. It’s our story and it’s a very short one. 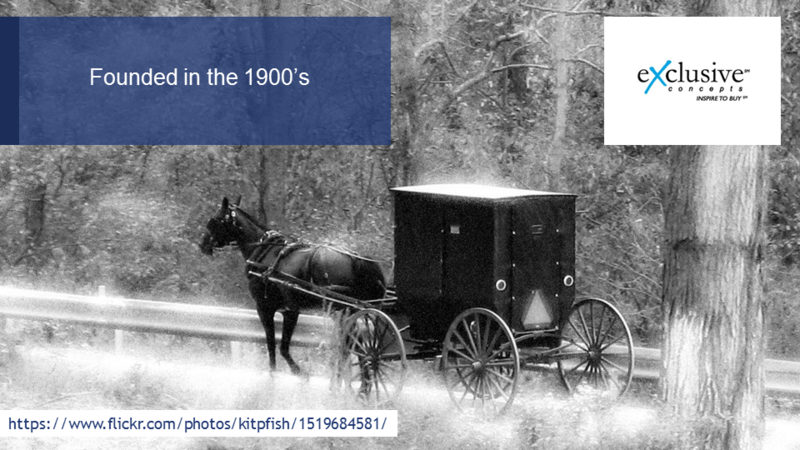 We started off in the 1900s as one of the first online marketing companies, 1997 to be specific. By 2013, so much had changed. First of all, as many people have experienced, SEO had changed dramatically and by 2013 link-building was dead. 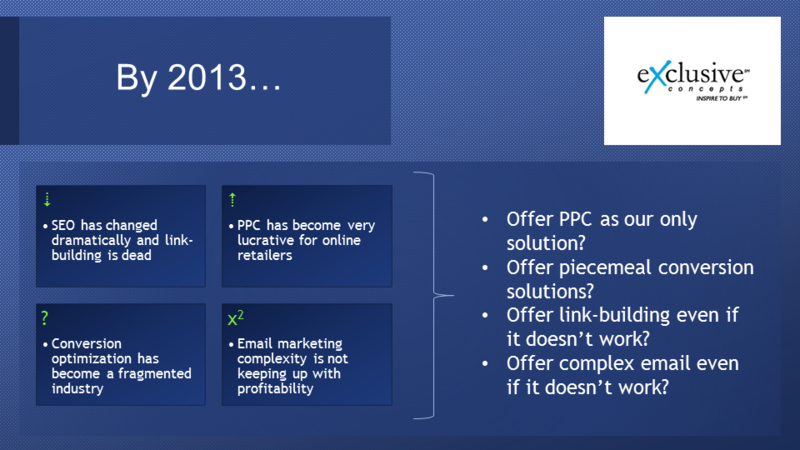 PPC at this point had become very lucrative for online retailers, lots of change there. 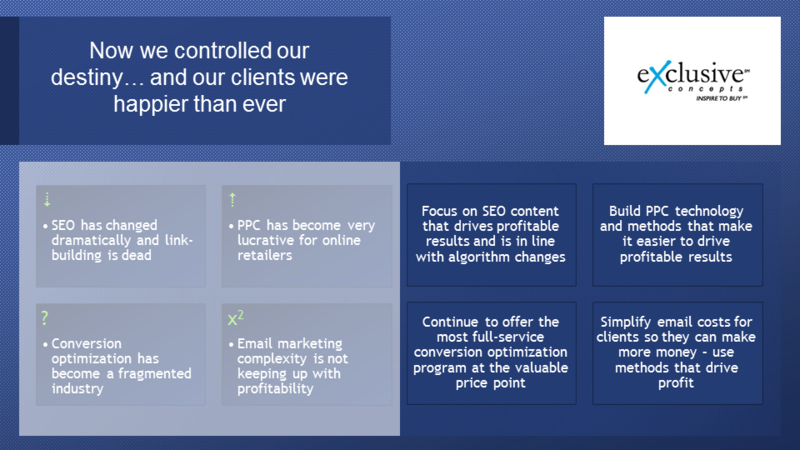 Conversion optimization, we were the actual first company that’s ever offered full-service conversion optimization and by 2013 you have conversion pundits and VC-backed conversion software companies, a huge fragmented industry of conversion. It was different from what we expected. Definitely different from what we thought retailers needed. Over the course of the few years leading up to 2013, email marketing complexity was being touted as the next big thing. 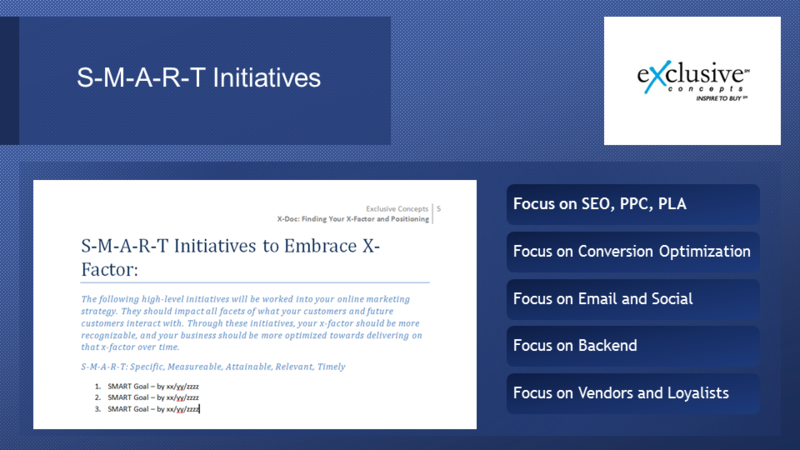 Don’t do simple email blasts, do segmentation, triggered emails, A/B testing. Pay for an ESP that is 10 times more expensive and you’ll get a 100 times better results. Unfortunately, this complexity was not keeping up with the profitability that it promised. We didn’t know what to do. We asked, “Should we just respond individually to each of these market fluxes?” “Should we only offer PPC as our only solution now that it’s so lucrative?” “Should we offer piecemeal conversation solutions because that seems to be the new demand?” “People are still asking for link-building, should we just offer it even though it doesn’t work?” Now people have been sold on this concept of more complex email. It doesn’t seem to be making more money for anyone. Should we continue to offer it? We tried to start off by looking at our strengths and said, before we make any determinations, to just be opportunistic. Let’s first look at our strengths and our scientists came together, our SEO specialists, PPC specialists, Google shopping, conversion, email, our strategists and what we’re able to determine, myself included, was that we do know how to drive qualified traffic, that we understand the concept of qualified traffic. 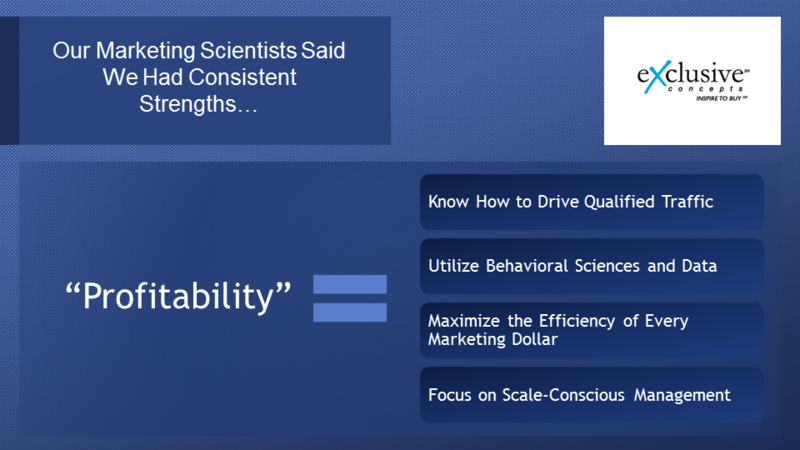 I’ll show you how to utilize behavioral sciences and data, even in sciences like SEO where behavioral data is not usually recognized as important. We have technologies and methodologies that focus on maximizing the efficiency of every marketing dollar. That’s pretty unique and we could do our methodology for a company that has a thousand products or a hundred thousand products. We’ve created methods that are scalable. While the geeks squeaked together to talk about these big concepts, what we we’re able to do, we were able to then boil it down to laymen’s terms. We actually focused on profitability. At the end of the day we go above and beyond trying to identify ways to make our clients more profitable, good to know. We went on to our clients and we continued to survey our clients and ask them what values do you care about because we think it’s just profitability, what do you really care about? The fourth highest area of interest, they said, was that we help grow revenue, they really liked that. 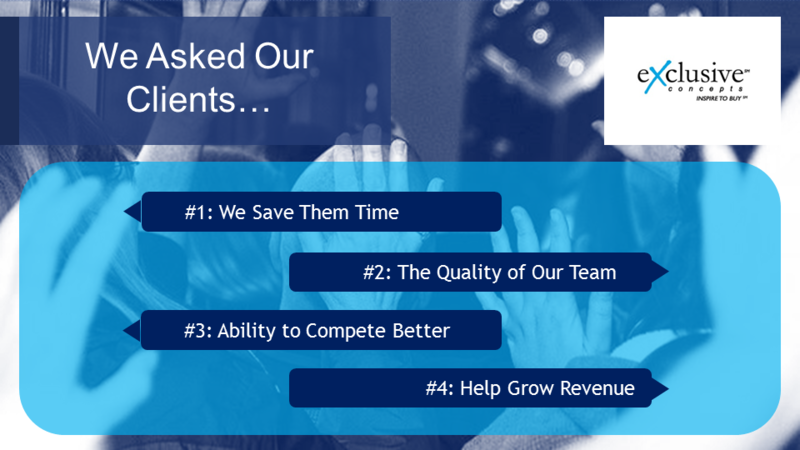 The third most common answer was you help us compete better, which is good, that’s part of what we wanted to do. Something that made us very happy, the number two most common answer was the quality of our team because we spend so much trying to find the right candidates for our business, our employees stay for long periods of time. We typically hire the top 100 candidates so that it’s a lot of work trying to get an answer like that because that meant a lot. But number one was that we save them time. We didn’t think that was important but then it made sense, our clients. You could usually fit the entire team of one of our clients in one small room, maybe one, two, three people and they’re doing the day-to-day management of the business. They may have a warehouse or something, but yeah, they don’t have the time to do marketing, they really don’t have the time to do marketing in a competitive way. We’re saving them that time. We’re allowing them to focus on more important things that they need to do instead of trying to build new skill sets so we’re saving them time. All of a sudden, it made sense, what we needed to do and how we needed to make our promises to the market, how we needed to optimize over time, that we become the best do-it-for-you ecommerce marketing and we consistently think about how to optimize our services towards increasing profitability. Then everything became clear. For all our challenges we needed to be opportunistic and we need to be consistent. 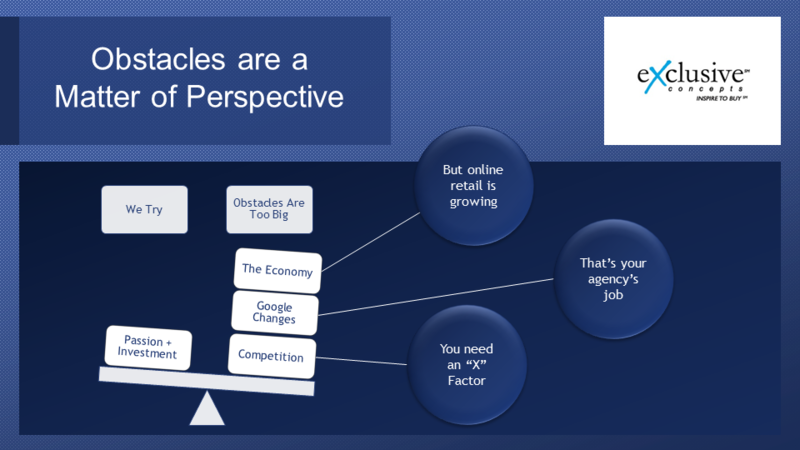 Focus on SEO content that drives profitable results and is line with algorithm challenges. Don’t worry about the fact that there’s a demand for link-building. 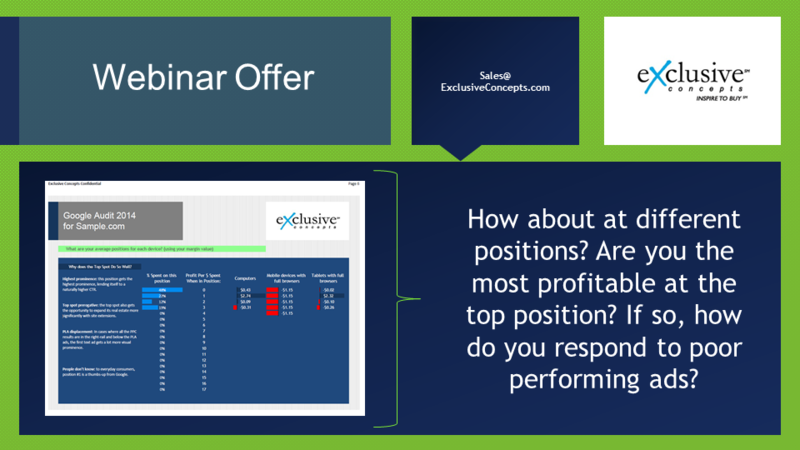 Create new demand where we can actually demonstrate profitability. Build PPC technologies and methods that make it easier to drive profitable results for our clients and take work off their plates. Continue to offer the most full-service conversion optimization program because that’s going to save people time. It’s actually going to make more money if we keep our price point as valuable as possible and that’s exactly what we did. On the email side, we started getting in denial. We decided, you know what, complexity leading to profitability is not living up to its promise so we’re going to come to the market with a simpler concept for email that will probably drive even more profit than your complex concepts at a fraction of the cost. Our X factor when you look at the concept that we were looking at before. Instead of targeting all online businesses with all online marketing offerings we now knew exactly what we were targeting. 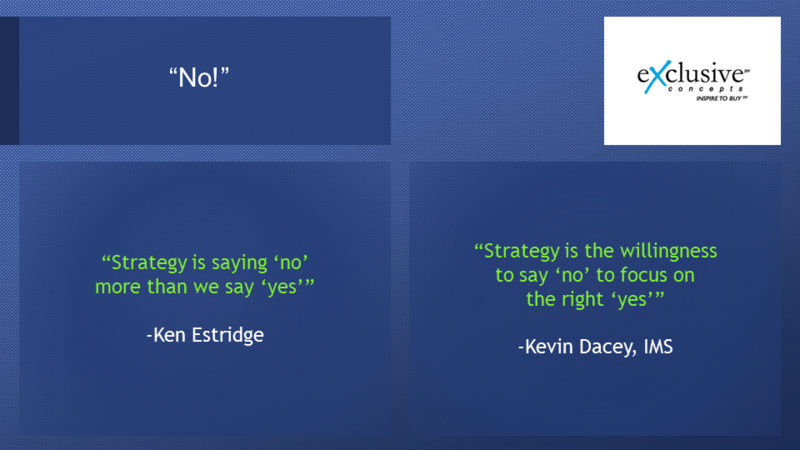 We knew when to say yes and when to say no. We have clear parameters around who we were and who we were never going to be. Since it worked for us and it’s helped our business so much we’ve fostered a program to help our clients. We are now the agency with internet marketing strategists that focus on mid- and small-online retailers at no additional charge. We have Tim Smith, Kevin Dacey, Stacey Bennett, Tom Yakas on our team. Strategists that work with clients on online strategy and we don’t charge our clients anything for this extra service because we know, if we can help you define a better business plan and a better strategy, it is more likely that you are going to succeed. And if you succeed you stay our client for life. At this point, this is where we ask the question, do you have a sense of what your X factor is, at least one X factor and only 16 percent of people said yes, very clear on what it is. Now let’s get into the X factor workshop. 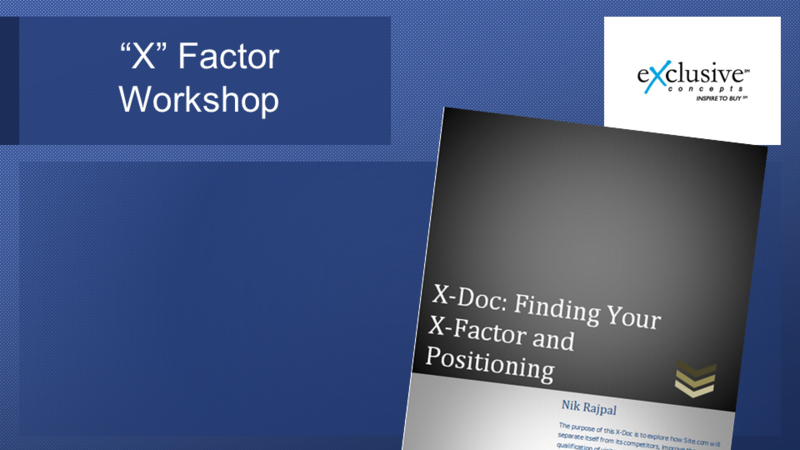 The X factor workshop is a workshop that our internet marketing strategists conduct with our clients. It’s something that we actually do for free for our clients and we help them develop something stronger for their business. It pours in to everything that we do and everything that they do. While you are going through this video, please grab a pen, don’t be shy. We definitely encourage taking notes and luckily now, this is a recorded version you can play it back, play it forward, send it to people that you know can benefit from this. Please don’t forget to do that if you’re watching this video, you watched the live recording and you know someone can benefit from this, please send it to them. Do good, pass it along, pay it forward. I’m going to do three quick examples of how this X doc has changed three different businesses because this will make the case for why this is so important. The first example in one of our clients who has been in the aviation industry and at first targeted all aviation buyers, pilots, plane owners, mechanics and even enthusiasts, people who just like model airplanes and things like that. As we did the X doc we started to hone in on one major strength. This client had $1.2 billion in inventory on a 62-acre warehouse. Can you imagine that? The opportunity that matched up with it was that large buyers, buyers that actually need access to large inventory because they need to make a huge purchase, they were being underserved in the marketplace. Now we only focus on large buyers and this client is, on a pretty frequent basis, getting $100,000 orders because we changed his entire business message. 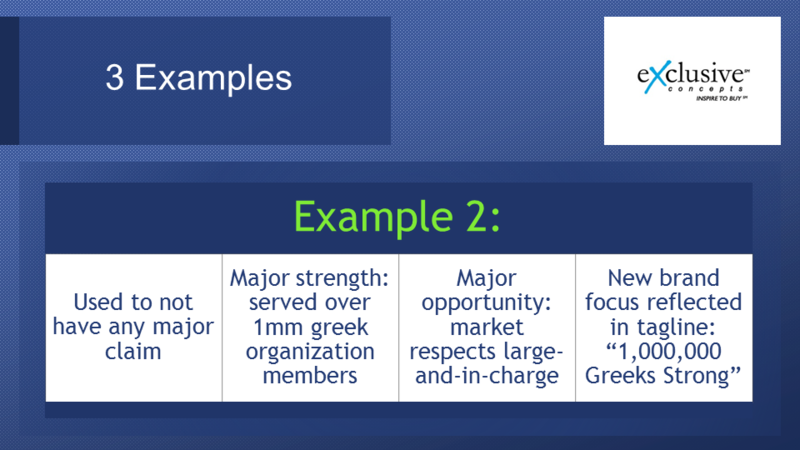 Example 2: It’s a company that works with fraternities and sororities and sells T-shirts and hoodies and whatever it may be to brothers and sisters of fraternities and sororities, and at first they had no major clients. As we started identifying what competitors were claiming, one competitor was boldly claiming they have served over 60,000 Greeks, and in our competitive analysis we identified that this client of ours that we’ve been helping do all the marketing for, SEO, PPC, conversion, email for about 10 years, by now we’ve helped them serve over 1 million Greeks and that’s 60,000. We’re continuing to work on new ways to further emphasize that into the community. It’s so powerful that it overcomes your audience. Example 3: The client that used to sell quilts and then over time they started adding just tons of inventory, tons of inventory well beyond just quilts. Their strength was that now with this wide selection of offerings it is possible that someone who’s bought from them in the past would now want to buy from them again but something different. There’s this lifetime value potential. The major opportunity was that there are no major loyalty programs in this specific online marketplace. If you have the inventory that could lead to a lifetime value, one way you get lifetime value and keep people in your circle is through a loyalty program. Now the site is creating as its X factor the best loyalty program in its marketplace. 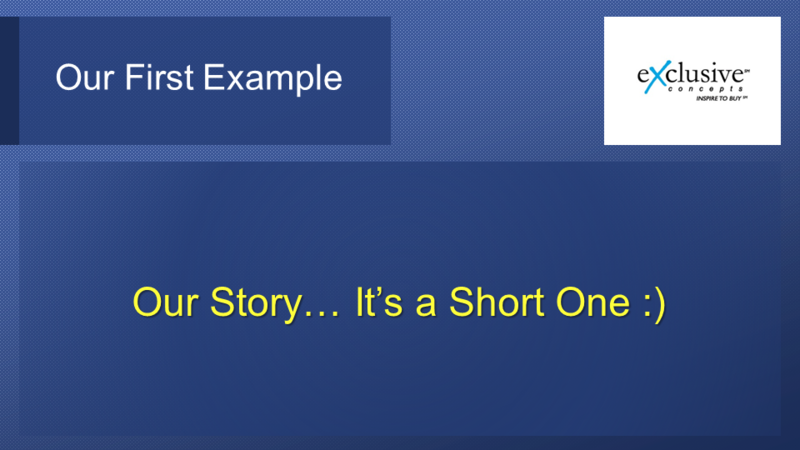 Those are examples, now how do you get to those examples for yourself, how can you become one of those success stories? 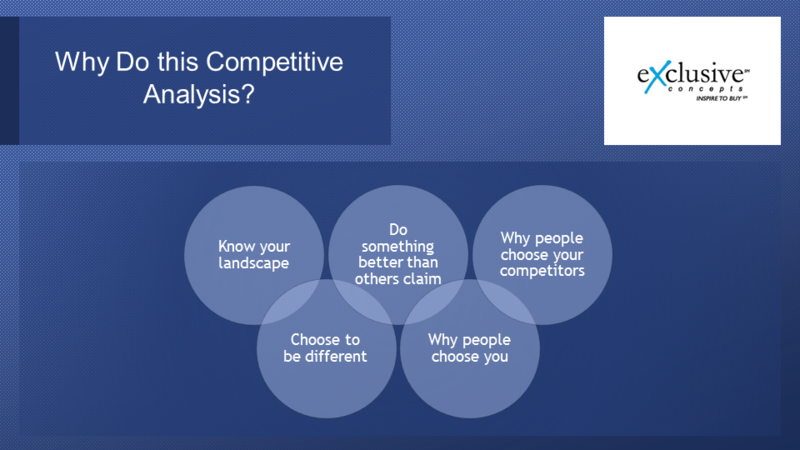 The first thing you do when it comes to the X doc is your competitive analysis. You want to choose four competitors, most of them should be direct competitors. You can have some indirect competitors as well. For each of these competitors, here’s what you want to do. You want to study the website, their ad copy, everything that’s available and identify what their taglines are and what their claims are, the messages. Then you want to compare against if there were no messages, what you would think the site was. How you would make your claim if you were their site, what do you see? Are there inconsistencies? Are there other X factors that they’re not claiming that are a little clearer? This will give you a great idea of how strong or weak your competitors are. Now you have to do the exact same thing for your site. To realize the reason you do this is to help you learn your landscape. Eventually, you want to choose to be different so you can figure out what people are claiming and you can do something better than they claim like the fraternity company that knew that someone was claiming 60,000 Greeks served and we have served a million at that point but it also gives you a great sense the first time you’re internalizing during this process, why people choose you versus why people choose your competitors. Because it’s not just you all have the same product and price is the only thing that matters. It’s really not like that. People are choosing different businesses to buy from for many different reasons. As we get into the next part, I have a quote here from one of our internet marketing strategists, Stacey Bennett. 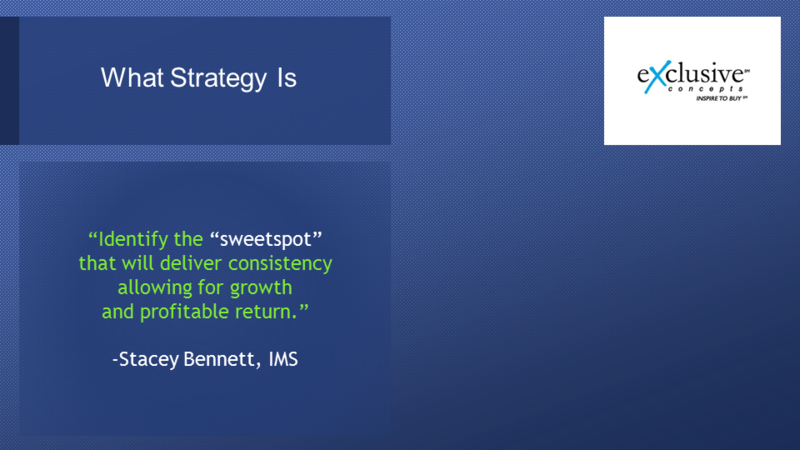 Stacey says, “Strategy is identifying the sweet spot that will deliver consistency.” If you continue to deliver consistently towards that sweet spot that will allow for growth and a profitable return. Let’s get there now. We’ve done a competitive analysis. We have a decent sense of what’s going on. 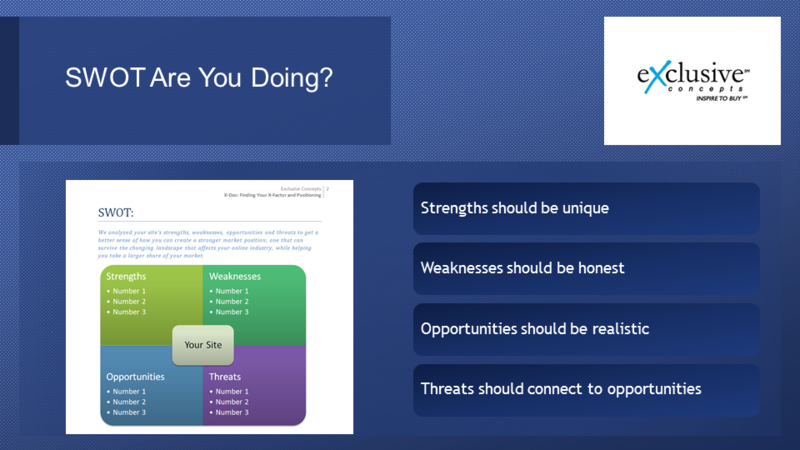 Let’s get much deeper with what the opportunities are in front of us so this is a SWOT analysis. SWOT is something that a lot of people have done for their businesses if you’ve ever been in any management courses that you’ve already done this but this is the chance for you to do it in a way that is incredibly meaningful that can potentially lead to a new plan for the next two years of your business. While we’re going through the strength on this site, remember your strengths you try to be unique. It should be something that other people are not doing. Your weaknesses should be incredibly honest. Be harsh on yourself. Your opportunities should be very realistic and your threats should somehow connect to opportunities. All right, one of the first ones we’re going to look at here is for the Internal Factors: Strengths & Weaknesses, stock and availability. The reason we start here is a lot of the people that attend our webinars and are part of our database and interactive Exclusive Concepts are businesses that have been in business for ten years, ten plus years online and as a well-established business there are certain things that you have that a new business will not have and one of those things is often stock and availability. Do you have any advantages or disadvantages with stock? 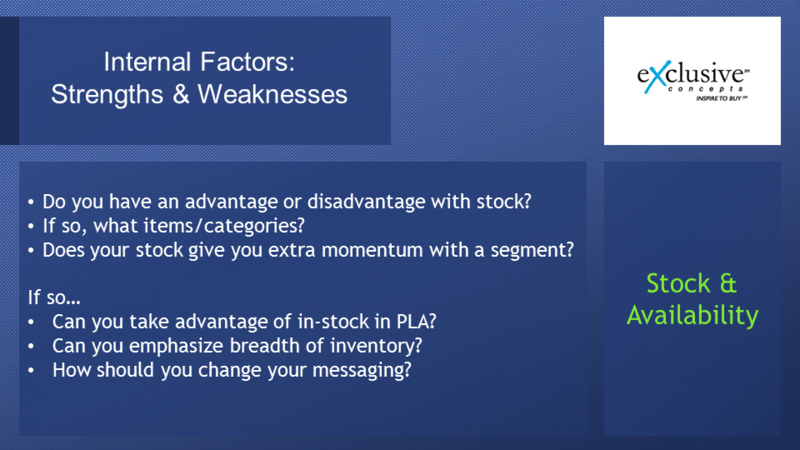 If so, what items, what categories and does your stock give you any extra momentum with the segment? For example, our clients that have $1.2 billion in stock, yeah, it helped them with larger buyers. If so, if you have this stock can you take advantage of the in-stock with Google shopping or any other PLA, Amazon PLA, Bing PLA? 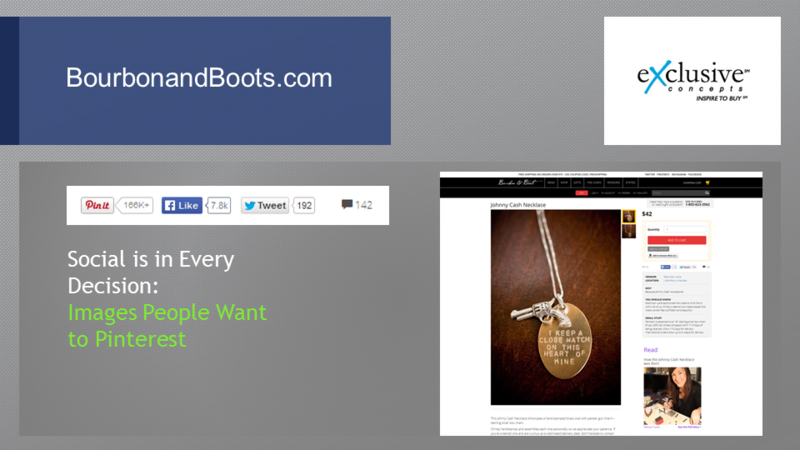 Can you emphasize the breadth of your inventory in a way that is meaningful to an audience? How should you change your messaging to reflect this availability? 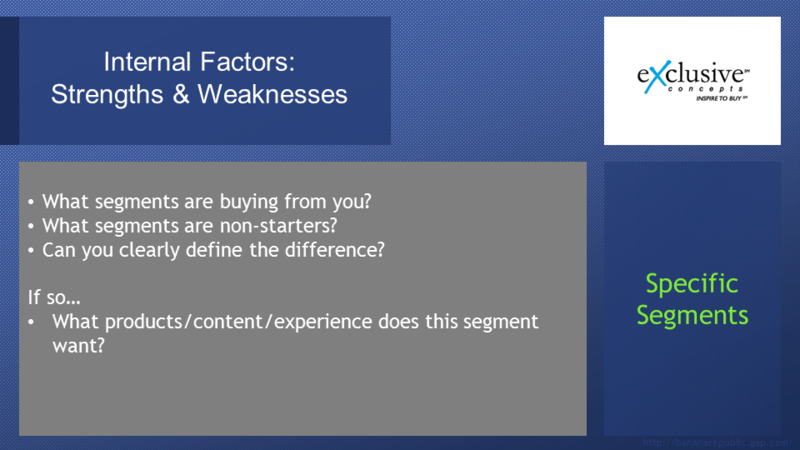 Next thing you may want to consider as one of your strengths or weaknesses is what segments are buying from you? Out of all the people you’re trying to target what segments are buying from you and what segments seem to be non-starters? Can you clearly define what differentiates them? Now if you identify who is buying from you, you start thinking about what products, content, experience that that segment wants. Let’s get some examples here. We have over 20 examples that we’re bringing in here to show some of these strengths, weaknesses, opportunities and threats. Cappellos, fantastic example of knowing your segment. 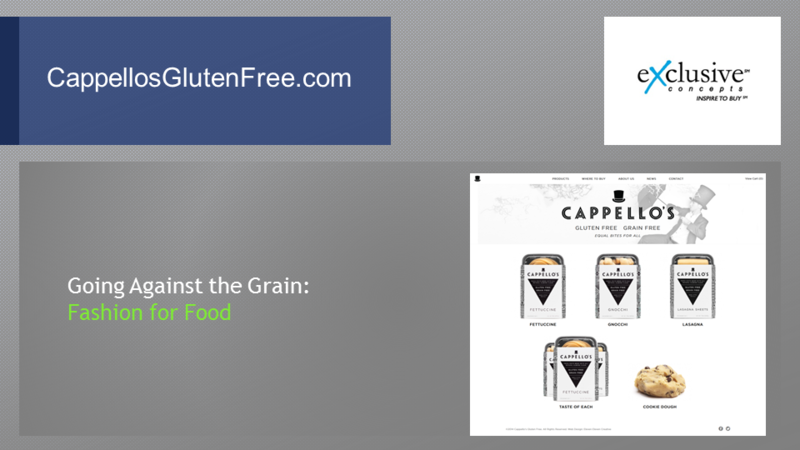 Say Cappellos targets people who are trying to have a gluten-free diet and in the spirit of going against the grain what they’ve done is for this unique audience that some people are doing it to take a different approach to diet than the mainstream. There is this counterculture aspect of the gluten-free world and this is something that Cappellos tapped into because they’ve created a counterintuitive website. They created a fashion site for food. As you go through CappellosGlutenFree, it is amazing. It is a beautiful fashion-forward website. This is actually something that can be used for any industry, this concept of just becoming a fashion-oriented site for X, Y, Z to differentiate yourself. If that makes sense with your audience it is something that has potential to be your X factor. 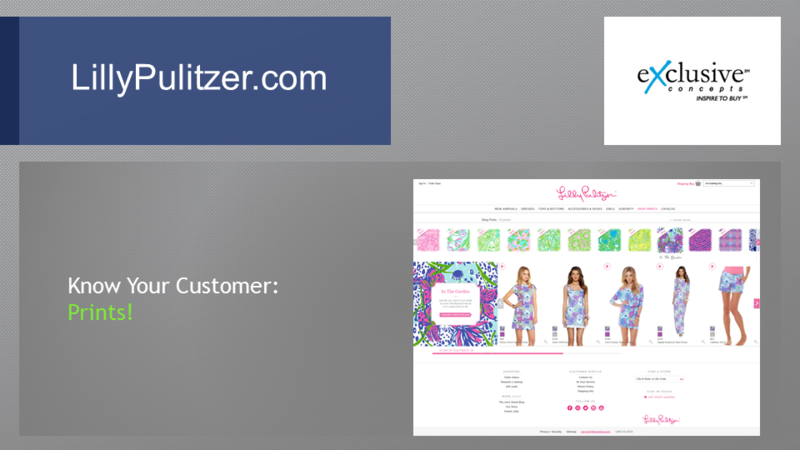 Lilly Pulitzer, understand that one of the reasons that people shop with Lilly Pulitzer in the first place is Lilly Pulitzer is known for prints. Because they’re known for prints and they’re driving a segment of people who are interested in prints, instead of creating a traditional shopping experience, what they did was created a shopping experience based on prints. You actually shop and choose what you’re going to look at based on a navigation of prints. This is a fantastic concept. Dollar Shave Club is one of the funniest websites online and it happens to be an online retail site. Because Dollar Shave Club is trying to drive people to their home page to sign up for something that is just about a dollar a month, very cheap shaving equipment. It seems like they have identified that the college kid is going to be their perfect target audience so they created some college-style humor. 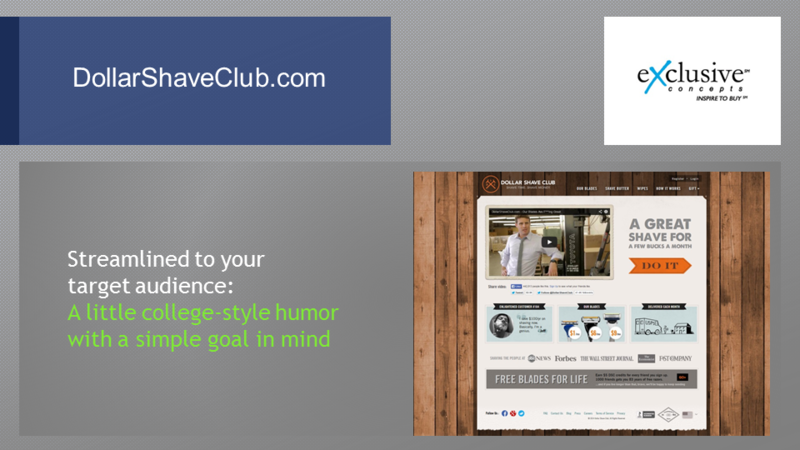 If you want to see a website that is truly genius when it comes to humor and happens to be an online retail, definitely check out Dollar Shave Club. If you target the college world, this may be an ideal option for you as well. Okay, more strengths and weakness that you might have. Think about the relationship you have with the loyal customers. 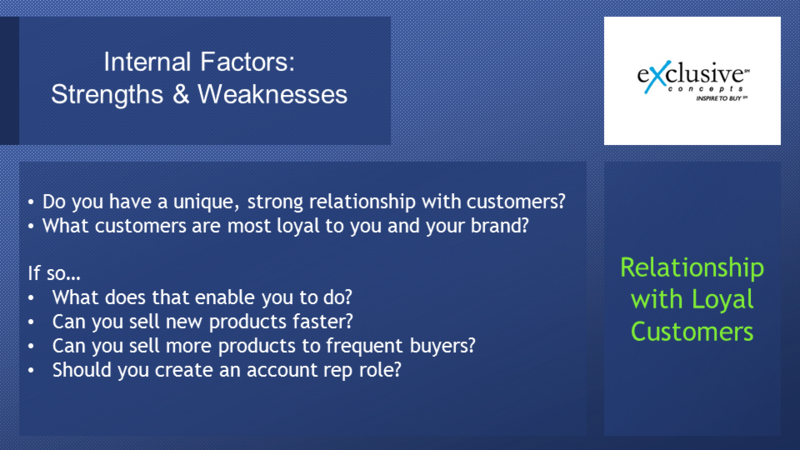 Do you have a unique strong relationship with certain customers, what customers are most loyal to you and your brand, how do you define them? If you do have loyal customers here’s what you start thinking about. What does this enable you to do? Can you help one of your vendors sell their products faster because you know that you can take it to marketplace through your database? Can you sell more products to frequent buyers if you know that people have an ongoing need for your type of inventory? Should you create an account rep role on the backend so that someone from your business is actually corresponding with your top buyers and trying to get them to buy more? These are all things to consider. Now Staples has done a great job with understanding its type of customers and the loyalty of its customers. 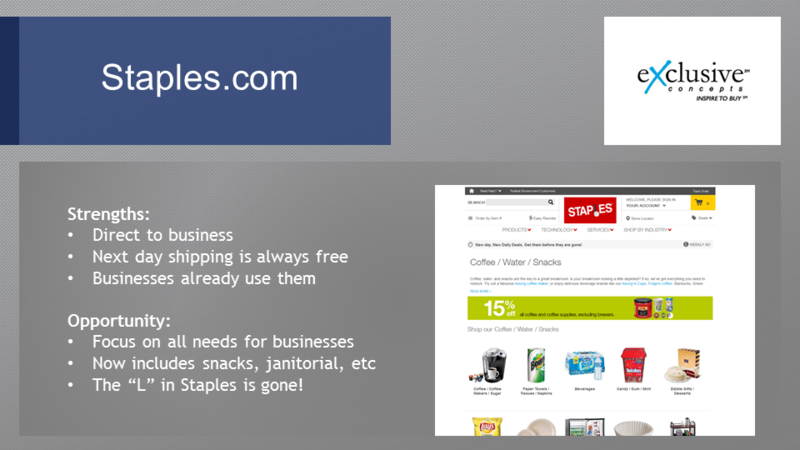 They know that over time businesses have started to use Staples for all their office supply needs and they have Staples cards. They’re always approved to buy anything from Staples, from their management, et cetera. They have this going, this loyalty concept going. This will direct the business, they have a great prop, next day shipping is always free and business is already using. What they saw as an opportunity was, well when people buy staplers from us they know to buy from Staples but then they also need to buy snacks for their office, janitorial equipment, things like that. Are they going to our competitors? Are they trying to find someone else who’s selling this because we could sell it to them too? That’s what they started doing, focusing on all needs for businesses, snacks, janitorial, et cetera, and they even took the L out of Staples which used to be a paper clip, and they’ve replaced it with other things to demonstrate the buying world that they’re not just about paperclips and staplers. Genius idea. 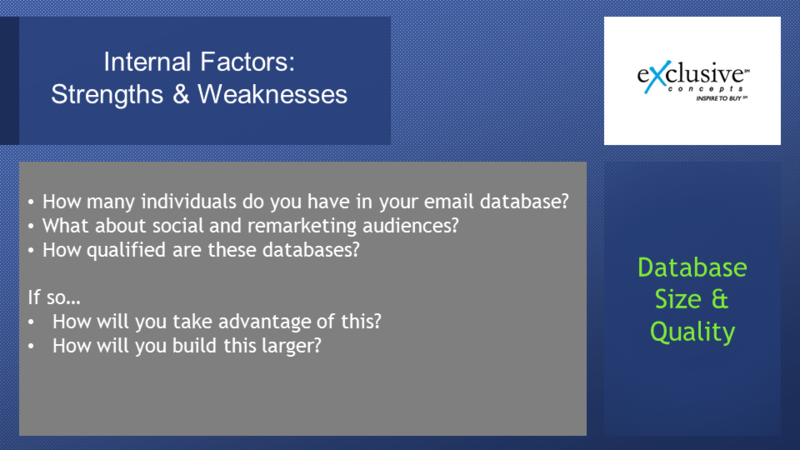 Other strengths and weaknesses are your database, its size, its quality. This analysis might take a little bit of depth, you want to identify how many individuals you have in your email database, check out your social, your marketing audiences through AdWords, whatever marketing platform you are using. Start analyzing how qualified this database is as well. Then you can start thinking about whether or not you can take advantage of this database to build your business much larger. You also need to think about how you can build the database much larger as well. 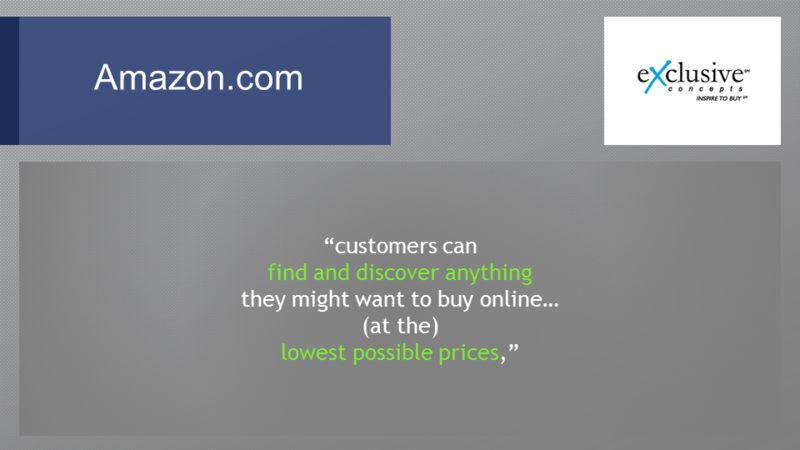 Amazon is a great example of a company that focuses purely on its database. We once have the largest customer set, and to create the large customer set, what it has set out to do from the beginning is create a vision where customers can find and discover anything they may want to buy online at the lowest possible prices, so two things at the same time. They want to have everything and they wanted to be lowest possible price. In many ways, it’s like a search engine now. Amazon is a search engine where you are searching for products to buy within the back of your mind some kind of idea that the price is going to be the lowest which means that Amazon is not doing everything that every customer wants, that the spectrum of values that people have when it comes to buying online, only a small portion of that spectrum is going to be met by Amazon ever, selection and price. Okay, before we switch from internal factors to external factors where the concept gets much, much bigger. We took two things that are mentioned from two different IMSs at Exclusive Concepts. 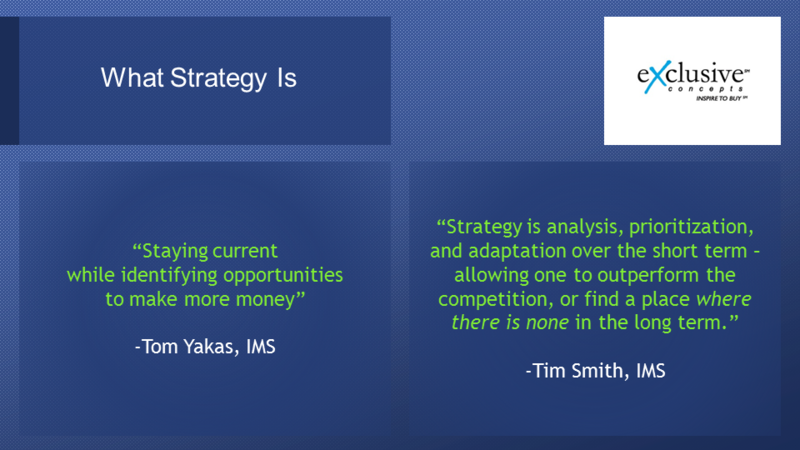 Tom Yakas said strategy is staying current while identifying opportunities to make more money. Tim Smith said strategy is analysis, prioritization and adaptation over the short term, but it’s the long term that matters here, allowing one to outperform competition or find a place where there is no competition in the long run. It’s a long game with series of analysis and prioritization and adaptation in the short term to get to that long point. One of the first things you can look at is customer service and it seems like a small concept but it’s not a small concept. We’re going to go through quite a few examples to really open up your mind in terms of what customer service should be online. What you want to ask yourself is: are there gaps in the marketplace when it comes to customer care service and support? If so, identify that gap, utilize available technologies and commit to this 100 percent. Here are three examples. 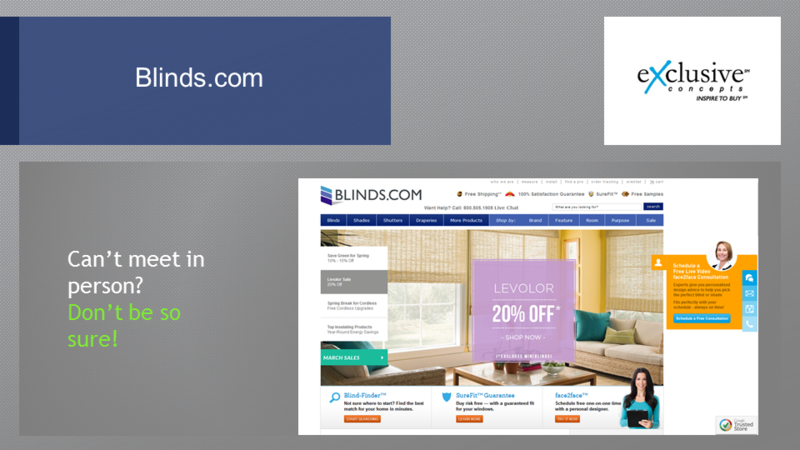 Blinds.com, if you went into a Home Depot or Lowe’s, you’re trying to get blinds, you’re going to get someone who kind of understands what they’re doing to help you out. If you can flag someone down, that is. What Blinds.com did was in real-time, you can get someone to help you out, a virtual salesperson that would actually walk you through the warehouse virtually through Skype and G Chat, whatever it may be, and allow you to see different inventory. Simple technology to overcome the biggest challenge in the marketplace, that is something that can be copied by a lot of different retailers. Glasses.com realized that when you walk into a Sunglass Hut, one of the things you get from a Sunglass Hut is you can try on glasses, and that changes what pair of glasses you’re going to buy. You just can’t do that online so instead of just falling in line with this obstacle, Glass.com decided to build the only technology that would allow them to be the only option online where you can virtually wear glasses. Through their app you can actually try on a pair of glasses on your face to see what it looks like which is an amazing, highly efficient concept and probably years ahead of their competition when it comes to this. There are two things that are happening there. One, someone is suggesting what you should wear and number two you’re trying it on and Rivets & Sway found a way to do both of those things where you can actually have a personal stylist to work with you through the website and then they will send you the products to try them out. You can literally do everything you would do at a LensCrafters just by going on to your tablet and in bed the middle of the night and start committing to all purchase that you would typically not have the time to do during your work day, amazing concept. 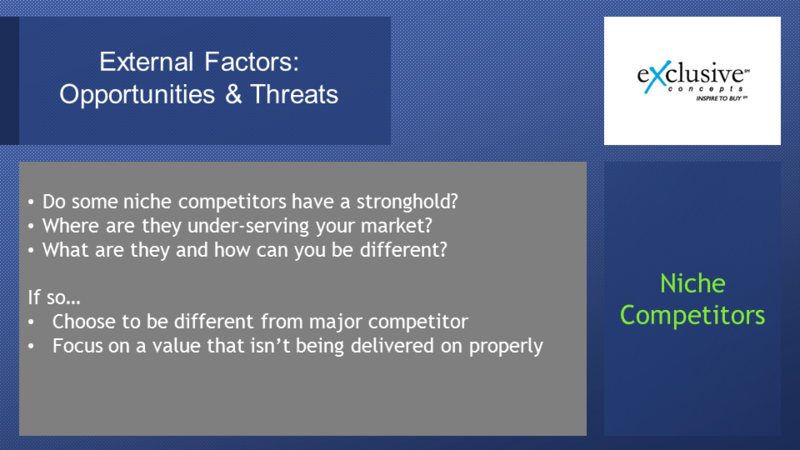 Other external factors, opportunities and threats that you want to think about. Can you exploit particular channels more? 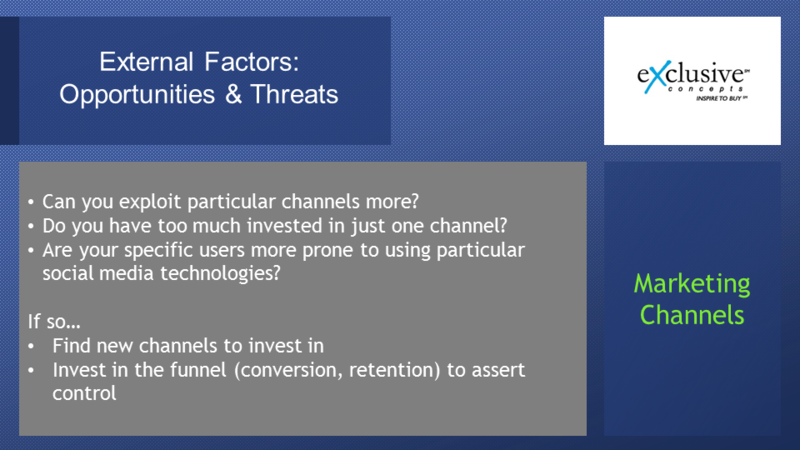 Do you have too much invested in just one channel? Do you know a lot of people invested in SEO very heavy until 2011 and for those who didn’t have AdWords or any other channels they lost a lot of money. They didn’t have a safety net. You want to ask yourself, are your specific users more prone to using particular social media channels? Maybe they use Pinterest or they use Instagram, something like that. By studying your audience you want to think new channels to invest in and you also want to make sure that as you invest in these channels that the rest of the funnel is really strong, your conversion and your retention side. Here are two examples of businesses that identified something unique about their audience. Bourbon and Boots put this particular image, this Johnny Cash necklace image on their website. 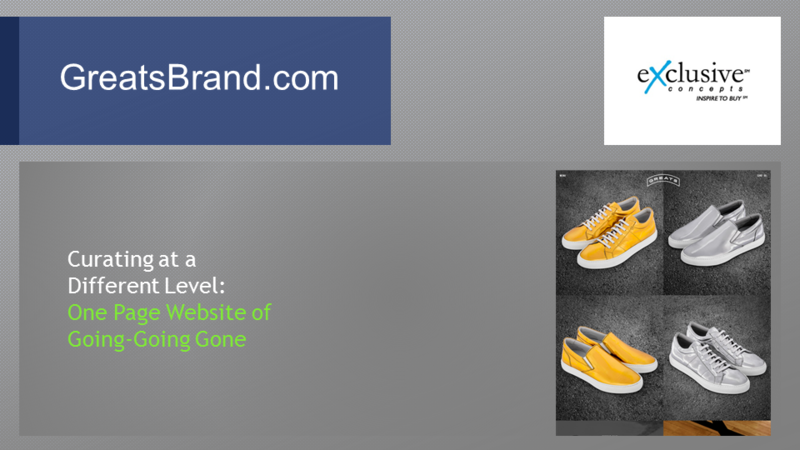 They try to create an image and content that they thought would be pin worthy on Pinterest and it was, 166,000 pins as of the time that we put this up on the website on this presentation. Now every single decision they make goes back to we need to keep our edge when it comes to Pinterest. They have a hugely active pin wall and the way that they curate their products and the type of images they put on the website are all conscious of whether or not it will help them further their Pinterest activity. 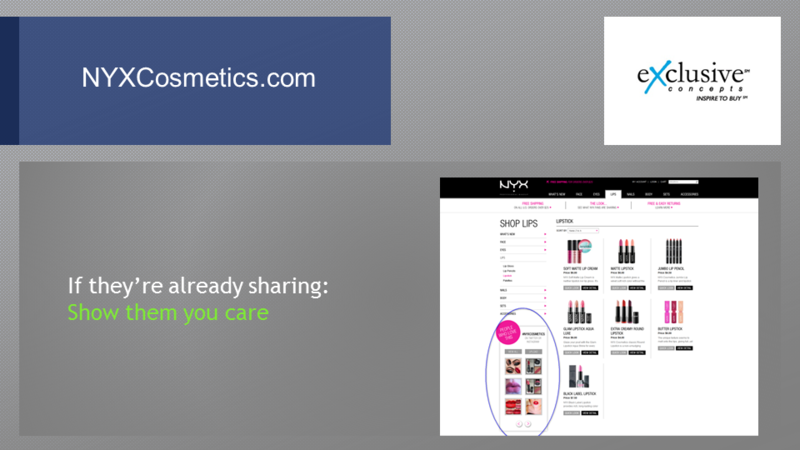 NYX Cosmetics realized that some of their users were Instagramming themselves using their eye shadow, et cetera, and instead of just letting that go and letting their users use Instagram on their own, they started connecting with their customers and even integrating those Instagram pictures into their website to foster more of that activity. If they already have a leg up on it, why not make sure that that momentum continues to go as strong as possible? Now Instagram users of this audience are constantly seeing NYX Cosmetic products. 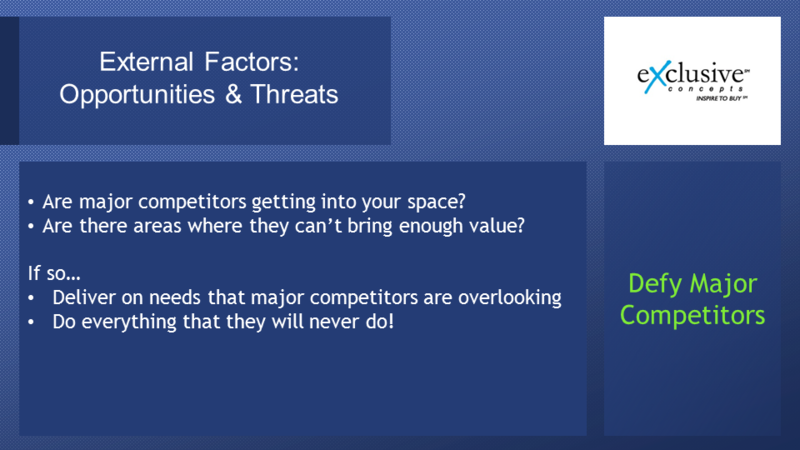 Other external factors, are there major competitors getting into your space like Amazon and Walmart? As we discussed Amazon earlier, are there areas where they just can’t bring enough value? Trying to be the widest selection and lowest price doesn’t mean you’re doing everything. If you can figure out what your audience would value that Amazon and the other big players cannot do, deliver on those needs and do everything that the large players will absolutely never do. Here’s two examples. 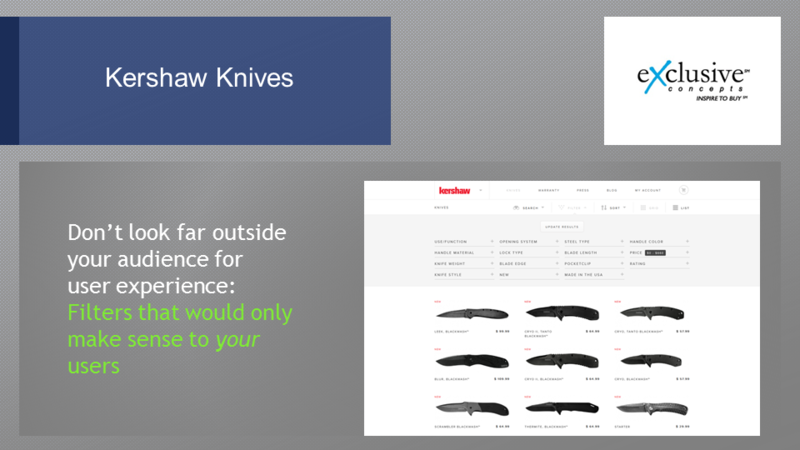 Kershaw Knives realized that Amazon would never create the type of filter system that only Kershaw Knives and its users would ever want. A filter system where you could filter down to locked type blade edge knife style, blade length, use and function, these are things that only true enthusiasts could create and imbibe within a filer system. This is once again, something that you can do in almost every industry. 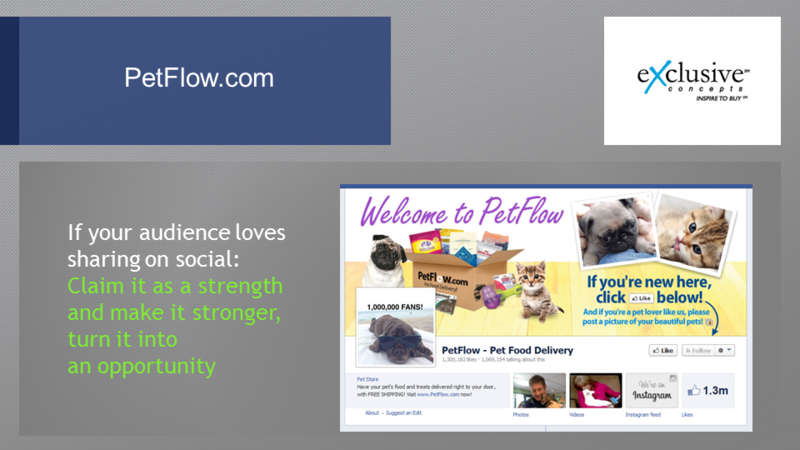 PetFlow.com, realized that everyone who has a pet loves to share anything about their pet to anyone who asks. If anyone asks me to see a picture of my dog, I have a section of my phone just for that and they knew that and they harnessed that. When you come to PetFlow.com the most prominent thing you’ll see is, if you’re new here, click “Like” below and if you’re a pet lover like us, please post a pic of your beautiful pets. They took advantage of the fact that people are dying for someone to ask them to see a picture of their pet, 1.3 million likes. This is the most prominent element on their entire website. It’s absolutely fantastic what they’ve done. Other external factors, niche competitors, your direct competitors. Do niche competitors have a stronghold? Are they under-serving parts of your market and, if so, where? How can you be different? If you identify a way to be different from your top players choose to be different from especially your major competitor and focus on a value that you’ve identified as being under delivered in your marketplace. There are quite a few examples because this is probably the biggest area where people can come through. 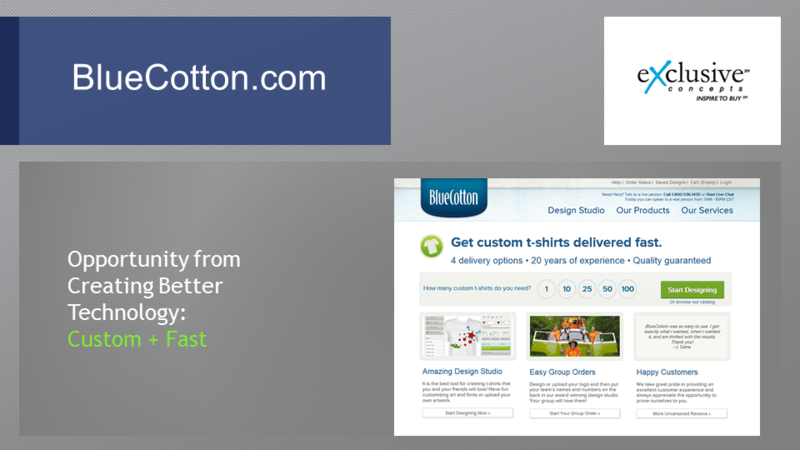 BlueCotton.com realized that people are trying to buy personalized products online and all their competitors keep saying is that it’s customizable, customizable, customizable> Even some people would say fast but Blue Cotton said, we’re going to say “custom” and “fast,” we’re going to say it clearer, more often and we’re going to optimize our entire operation towards delivering on custom and fast better than anyone else. Just those two things, not wide a selection or anything like that. By doing that better than anyone else, everyone else just seems like a copycat if they try and if they try to operationalize as much as they’ve done, it would still be six months, one year, two years behind Blue Cotton. IndoChino. IndoChino sells slightly higher end suits and custom-tailored shirts. Why do you go to a custom tailor? You go to a tailor because you want that tailor fit but tailor fit usually takes a tailor being right in front of you and measuring how to create that tailor fit. 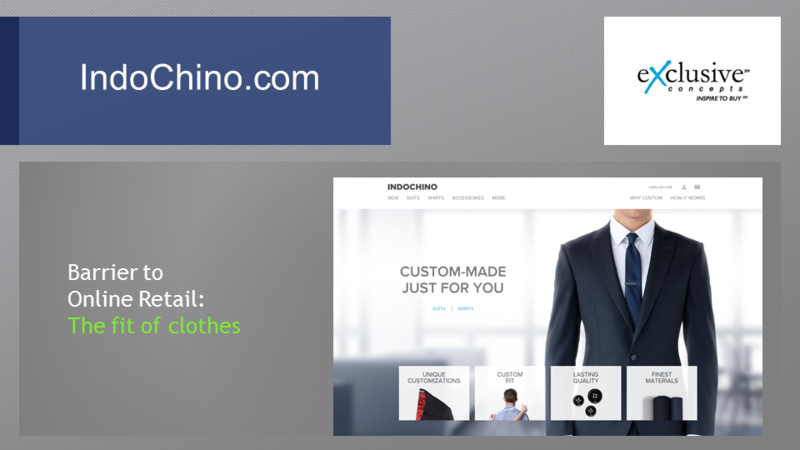 Now IndoChino set out to do the same thing but online through a process where you buy from them and it goes back and forth and they make customizations and custom tailorings to your suit and then save your profile with your dimensions so you can buy from them in the future and it continues to be custom-tailored to your body. They’ve been able to bring everything that you expect from your neighborhood tailor online, potentially with better prices and better access to higher quality materials. One of the things that they really do very well is — I use myself as an example — when I met my wife 13 years ago, I weighed 115 pounds, and then I got all the way up to 195, so 80 pounds and then I went down to 155 and I’m back up to like 172. My body shape keeps changing and I was a shopper on IndoChino, I could send back my suits and as my measurements change they will actually retailor the products to fit my new measurements, an amazing concept. Greats.com wanted to deliver on something that made people feel like they were looking at a selection that was carefully curated and an experience that was custom-delivered. Instead of trying to do this on hundreds of thousands of products or hundreds of thousands of pages on their website, Greats.com is essentially a one-page site where you’re scrolling through a collection of similar products, at the bottom are the ones that are just … they’re already out of stock because everyone’s already bought them, they’re sold out and towards the top are the ones that are still available. Every day you can go there and just focus on a small selection of products. Now this can be done for any industry where you’re selling something that people want, but they don’t need because they can come and buy as often as possible from you. 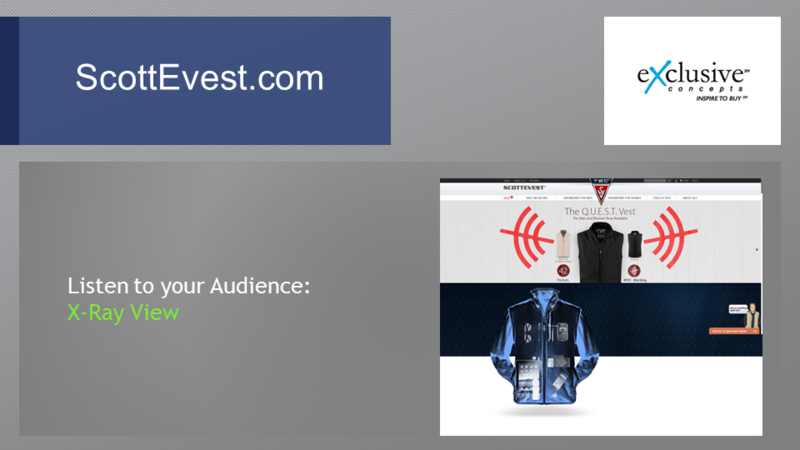 ScottEvest.com tried to do something incredibly genius from the beginning and showed a commitment that was well beyond what anyone else would do. 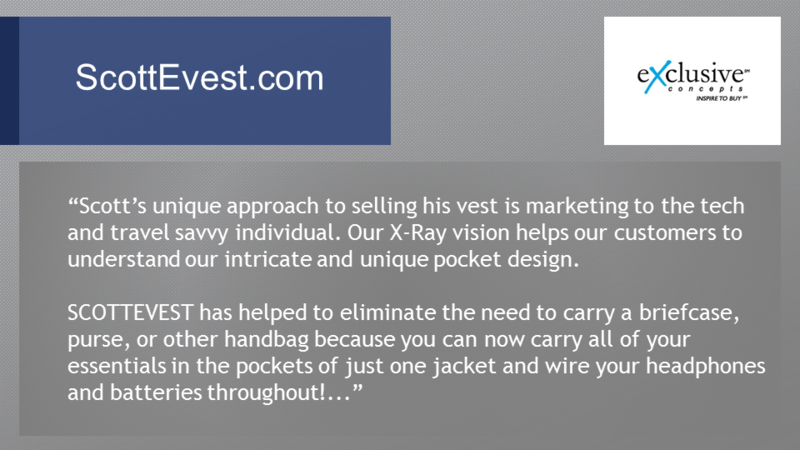 Scott identified that there was a way to create a vest where all the tech needs of a person could fit within the vest itself and then try to deliver a way for people to recognize that and that is through the X-ray view of their products. The people at ScotteVest were nice enough to give us a breakdown of how they arrived at this. They said, “Scott’s unique approach to selling his vest is marketing to the tech- and travel-savvy individual. Our X-Ray vision helps our customers understand our intricate and unique pocket design. That came from Mallory Spika, Pocket Expert, ScotteVest, Inc. You could tell how committed they are to their unique vision by having titles like Pocket Expert. 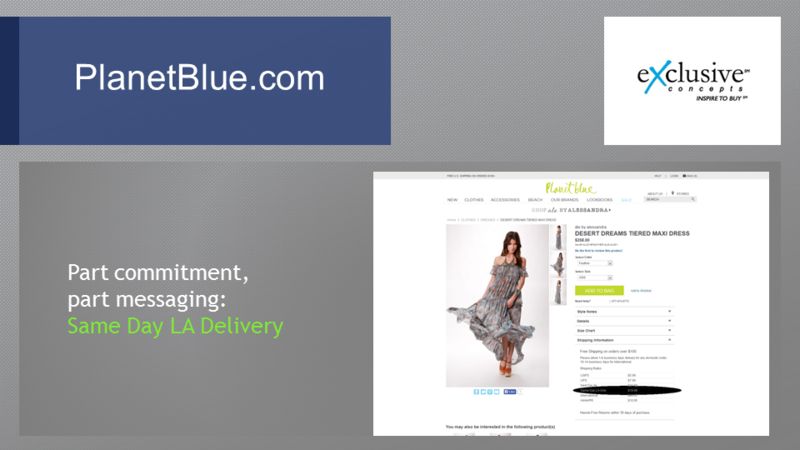 Planet Blue, Planet Blue realized that its niche competitors who are trying to sell slightly higher end dresses, $250 to $300 always had to be handicapped by the fact that if someone likes something and they were going out that night, they would never be able to get it online. Even though Planet Blue can’t do this for everyone across the globe or even the nation or even across the state of California they knew they could deliver this in L.A. so what they did was create an option for same day L.A. delivery and that is once again, something that might be a possible X factor for any one of the businesses out there. Something else you want to consider: Do you have unique vendor relationships? 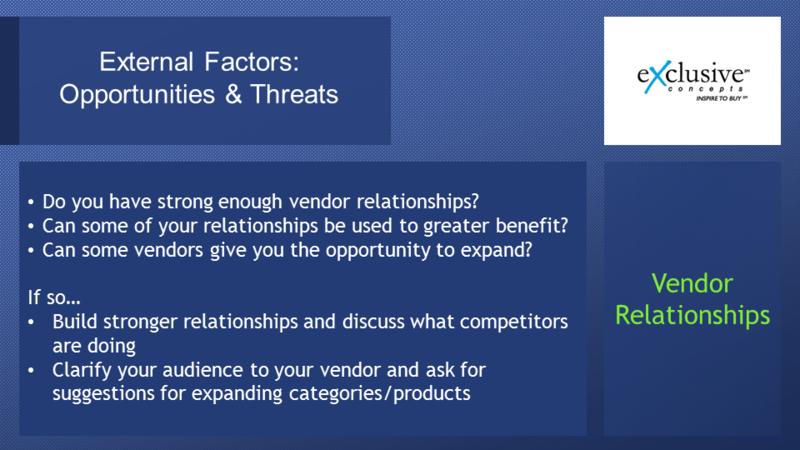 Do you have strong enough vendor relationships in general? Can some of your relationships be used to greater benefit? Can some vendors give you opportunities to expand? For example, if you have a vendor that is selling you highly modern add-ons to homes and you as the buyer are trying to reach an audience of contractors, you might go to your vendor and say, I think contractors don’t just want this one product that I buy from you, do you have anything else that would be modern equipment for the home that I can bring and expand my sales to these contractors? That is something that we’re doing at one of our clients right now that sells LED road plates for contractors. We’re trying to help them identify other types of offerings that are just as cool as LED road plates that their contractors might want to buy and their vendors might be able to offer them. Some of the things that we advise are build strong relationships with all your vendors and discuss what competitors are doing. Your vendors are a great source of information. When talking to your vendors always articulate who your audience is and ask your vendors to give any suggestions of other categories of products that they might have for your audience. 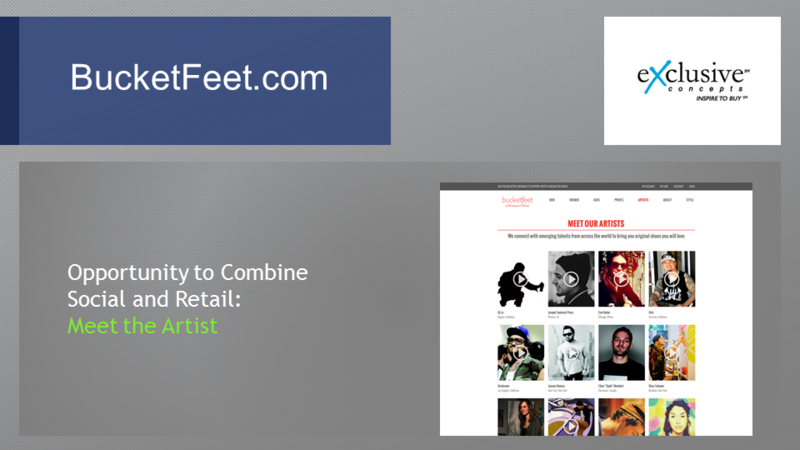 BucketFeet has a unique relationship with their vendors. There you have products that are created by artists and instead of just allowing their website to be focused on the products they’ve actually made the website also focused on the artists themselves. If you have that type of scenario, it is something that you can create for your own website. 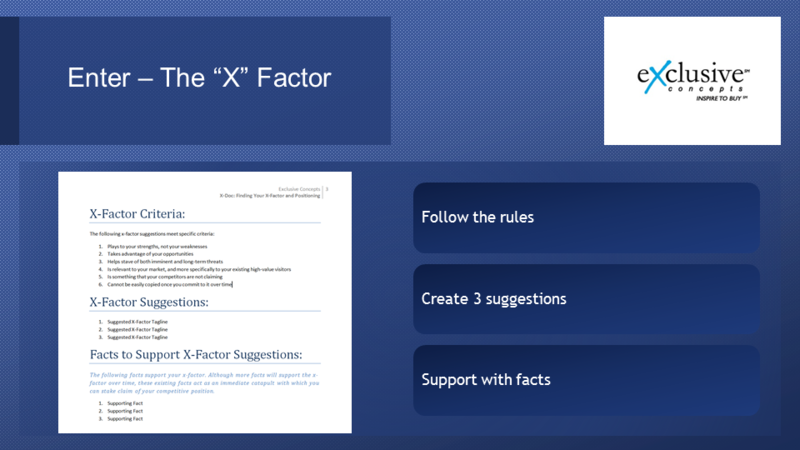 Now that you’ve looked at your competitors, your strengths, your weaknesses, your opportunities and your threats it’s time to start honing in on a potential X factor and to get there we need to follow the rules, create at least three suggestions and then support those suggestions with facts. 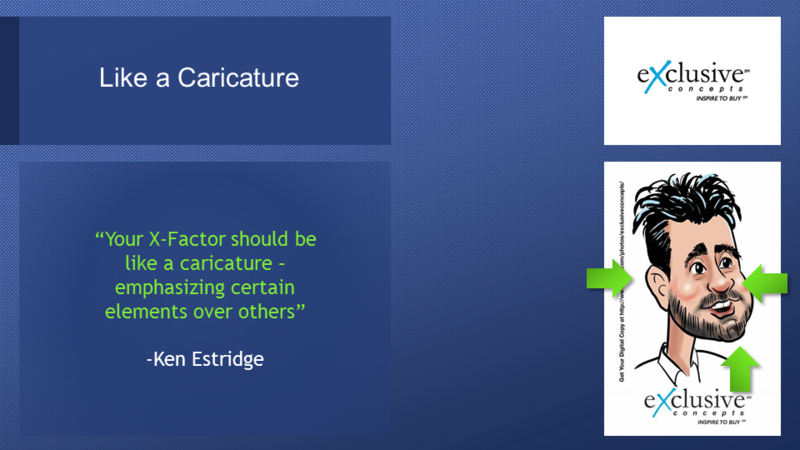 Ken Estridge once again says your X factor should be like a caricature and emphasizes certain elements over others. You’re not everything to everyone. You’re not normal. At IRCE 2013 we had a caricature artist do our caricatures just as my nose and my ear, my chin, maybe emphasized by a caricature artist. That’s similar to what you should be doing with your X factor, emphasizing it. One of the webinars attendees commented on this on how harsh this was of a caricature of my face. 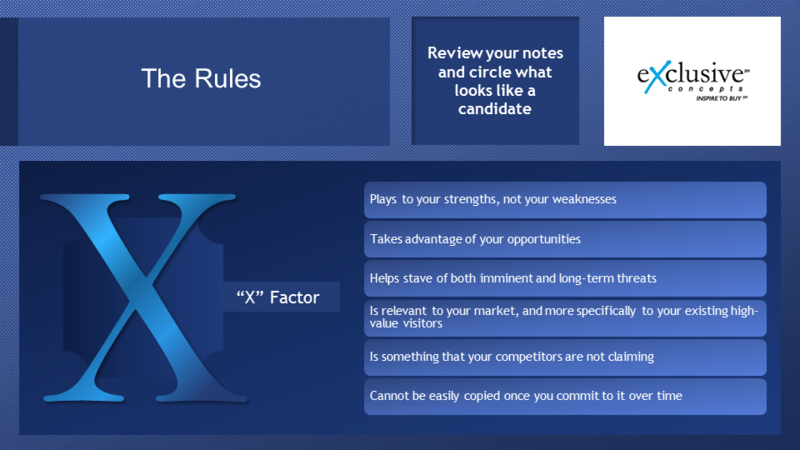 When defining the X factor rules, you want to review the notes that you’ve already taken and start circling what may look like a candidate. Your X factor, it should play to your strengths and not your weaknesses. It should take advantage of your actual opportunities. 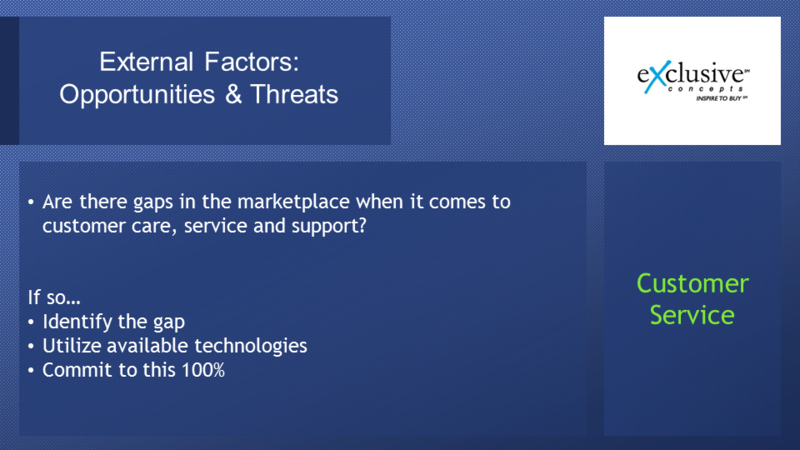 It should help stave off both imminent and long-term threats in your marketplace. It has to be relevant to your market and more specifically to your existing high value visitors, that’s what we talked about loyalty, et cetera. 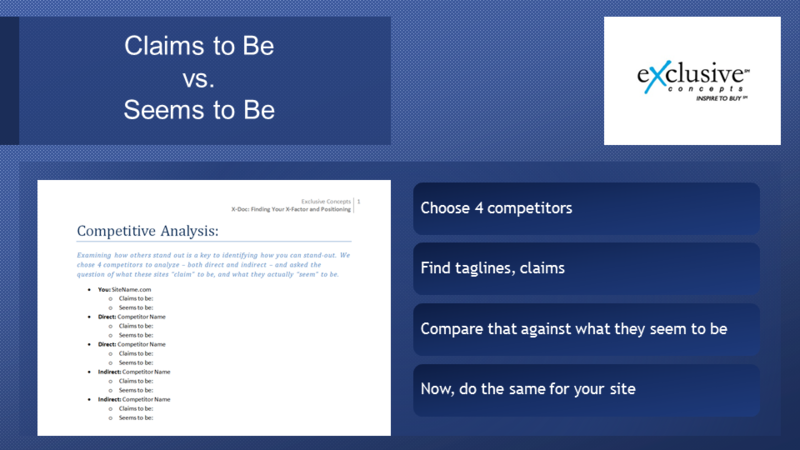 It should be something that your competitors are not claiming. If they’re claiming it they’re not doing a great job with it, you might be able to claim it as well but once you commit to this, conceptually, once you commit to this X factor you should be able to believe that it will be very hard for one of your competitors to catch up if they started catching up or they tried to start catching up one year from now. This was the second time where we asked people to tell us whether or not they have at least one idea for what their X factor might be and now 49 percent of attendees had a very clear of what their X factor might be so hopefully you’re at that place as well. Now if you have an idea of what it might be, can you come up with at least three facts, things that you already have established within your business or that you will commit to in your business to support your X factor claim? Over time it should build from three, to five, to ten, to fifteen because everything you do should be focused on maximizing your X factor over time once you’ve committed to it. We’ll do a quick commercial. 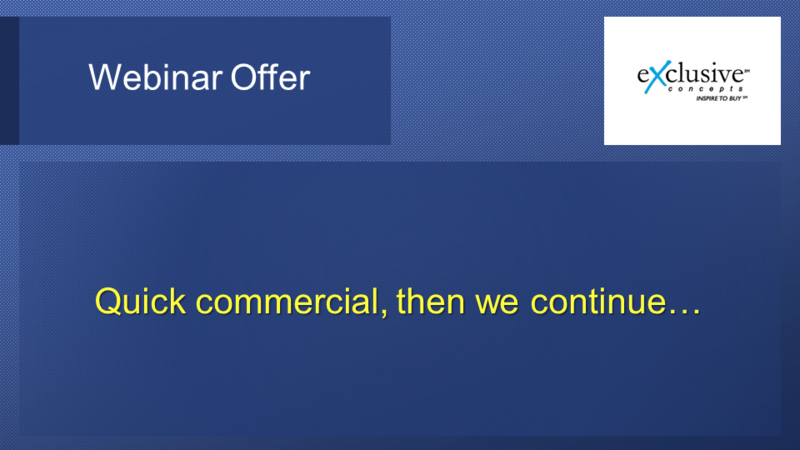 If anyone is watching this presentation, we have an offer for you and then we’ll continue, we have a few more parts left. If you write to us at Sales@ExclusiveConcepts.com, our webinar offer is that we will do what we call the Google Audit for 2014. It uses a unique technology to identify a multitude of possibilities for your growth when it comes to PPC, Google Shopping and SEO. The first thing we would do is actually a qualitative analysis. We have a very close relationship with Google and one of the things we ask them to do for us was analyze of the hundreds of different settings that exist in AdWords what six settings correspond to the best performance when it comes to ecommerce? We’re going to check whether or not you have those settings working for you then we will do some calculations to identify whether or not your current agency is using metrics that are duping you by actually inflating your results and easily 95 plus percent of people that we talked to have that scenario going on. They think they have a positive metric, they have a positive performance and then when we use the right numbers, we include gross margin, et cetera, we find out that they are losing money. This is probably one of the most important things we can identify for you. 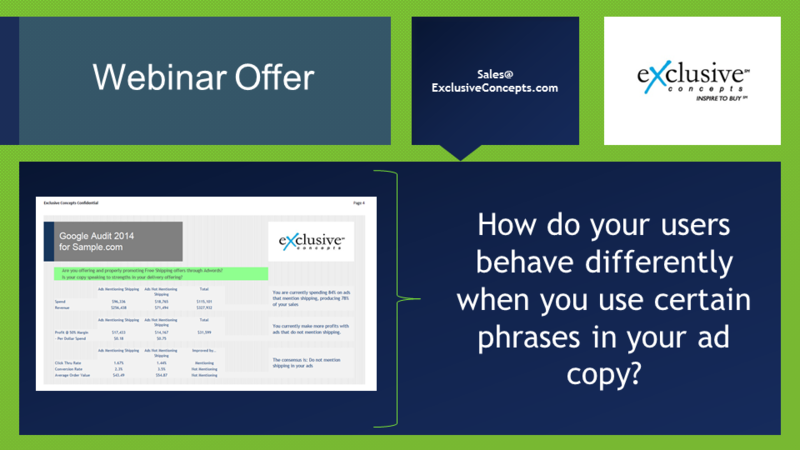 We want to identify using a custom technology how your users behave differently when you add a certain keyword within your ad copy. 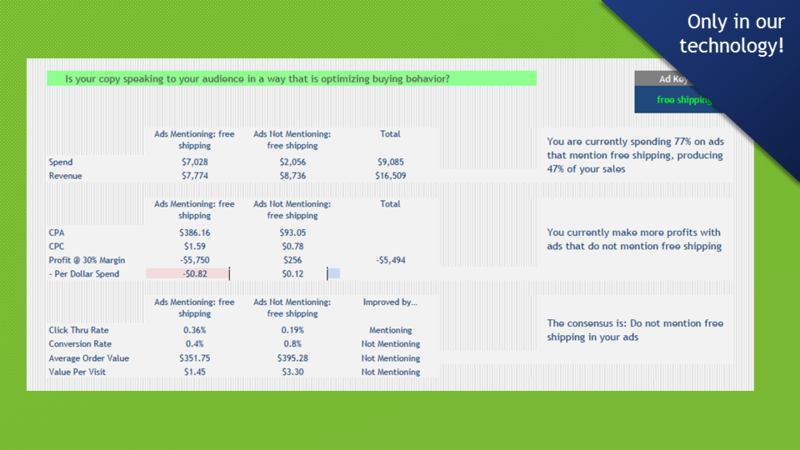 For example, here’s a recent analysis that we did where 77 percent of ads from this person mention the term free shipping. What you can see is when they mention free shipping after cost of goods sold, they’re losing 82 cents for every dollar they spent but when they don’t mention free shipping they are spending 2,000 to make 9,000 and this doesn’t include any brand ads. Now why is it so different? Well, for people who did not come in through an ad mentioning free shipping their conversion rate was double. It’s possible that this website was not properly mentioning free shipping on their website. Average order value was higher and when they did mention free shipping Google was making them pay more for their ad, almost double so everything else was in the profit zone. It could be the same thing for your site. 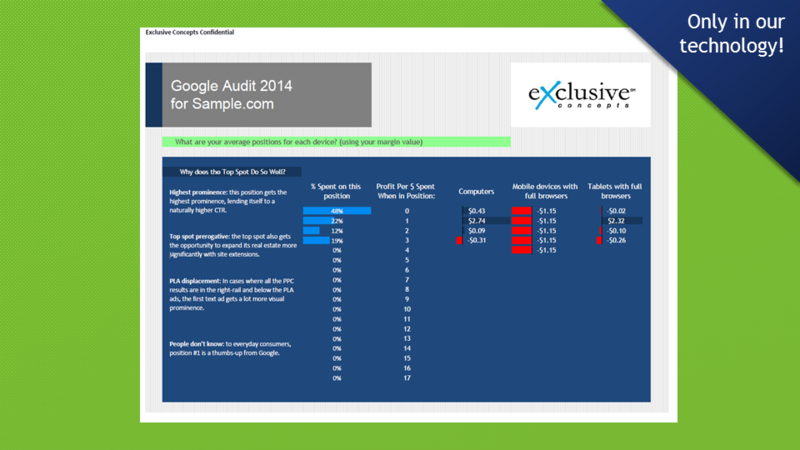 We could test out any series of keyword during this audit. Again, just write to Sales@ExclusiveConcepts.com to ask for this. 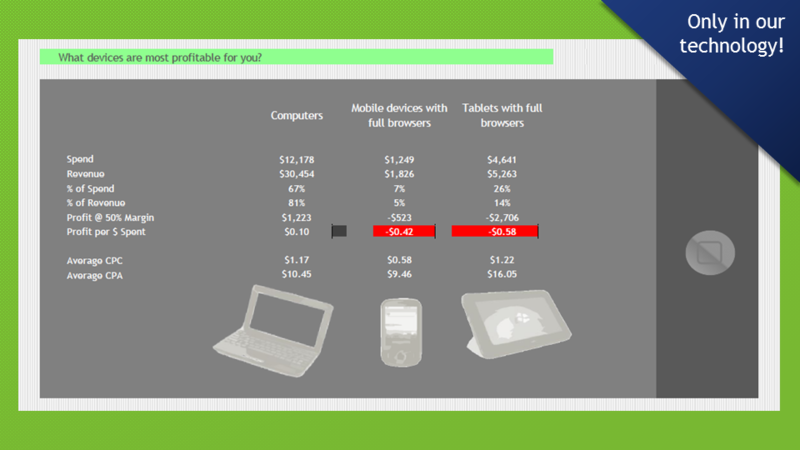 Now we’ll see how profitable you are when users are interacting with your ads on different devices. 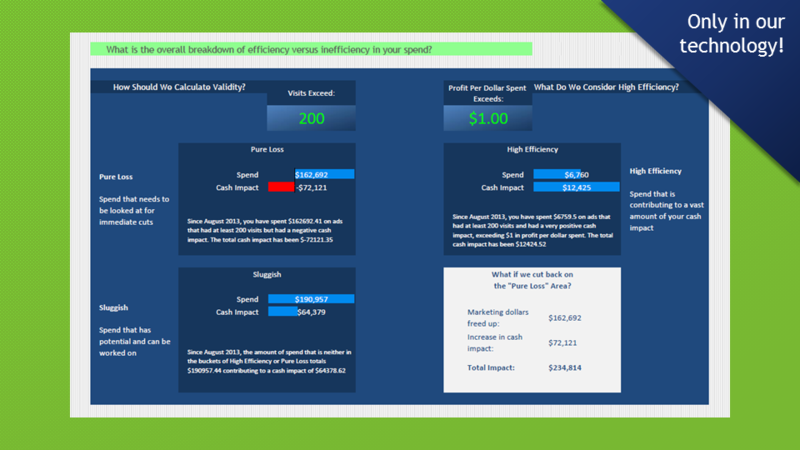 In this example we see that our client, our prospect was spending 67 percent to create 81 percent of their sales through computers but everything else was upside down, disproportionately more spend and less revenue and actually losing money. Then we will cross segment that with all the different positions that you could target. Typically, what we see is when you target the higher positions, especially position number one, it is the most profitable. I will see whether or not that’s the case for you and what that means in terms of your ability to scale. Then we use another technology to calculate how many of your ads have a statically valid trend line of loss, you’re losing money versus a statistically significant trend line of success, of profit and here’s an example from actually last week where a prospect had spent $162,000 in the last eight months on ads that had at least 200 clicks but after cost of goods sold they lost $72,000. They could have freed up those marketing dollars and invested it into any other marketing activity and they would no longer have been neutralizing all the other cash impact they had from other activities. Without that they would have made about $75,000 in cash, but instead they made about zero dollars. This would be much clearer as we do this for your account. 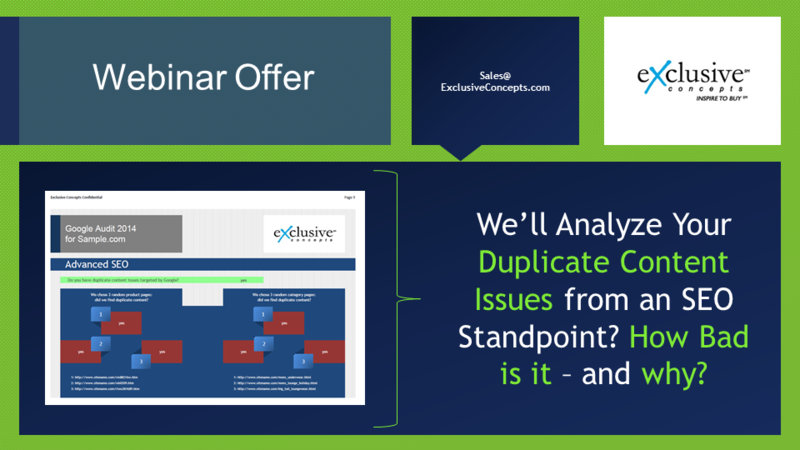 We’ll also analyze whether or not you have any duplicate content issues from an SEO standpoint. 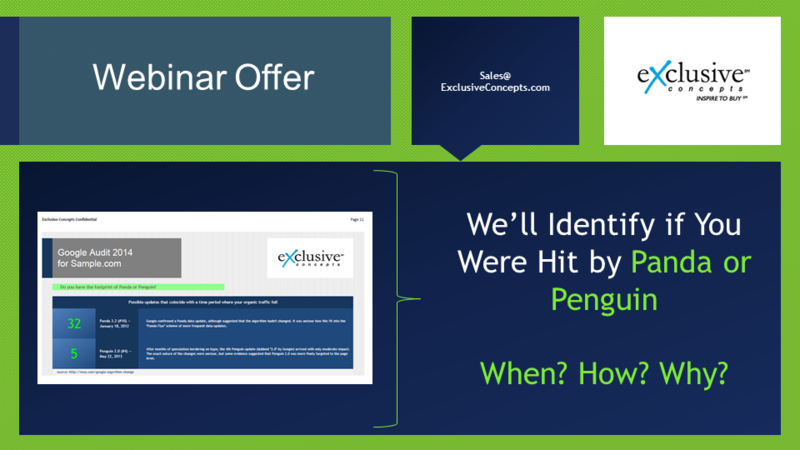 Whether you’ve been hit by penguin or Panda, when, how, and why. Whether or not your current content meets Google’s guidelines and what you can do to improve and it is such a comprehensive audit. 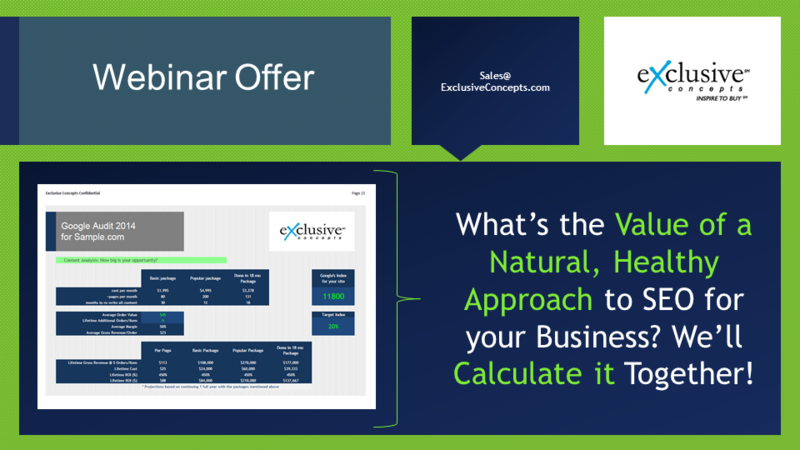 We’ll even help you calculate the profit potential of investing in a more natural, healthy approach to SEO. 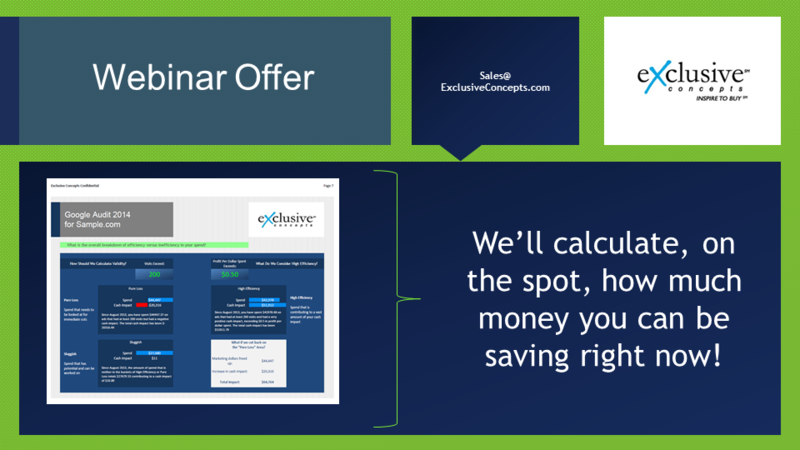 I’ll actually be the one presenting it for you so once again, write to Sales@ExclusiveConcepts.com. You can write to me at and nrajpal@exclusiveconcepts.com and we’ll organize this free audit for your website. Let’s get back to the final few things to look at when doing your X doc. Positioning is next. 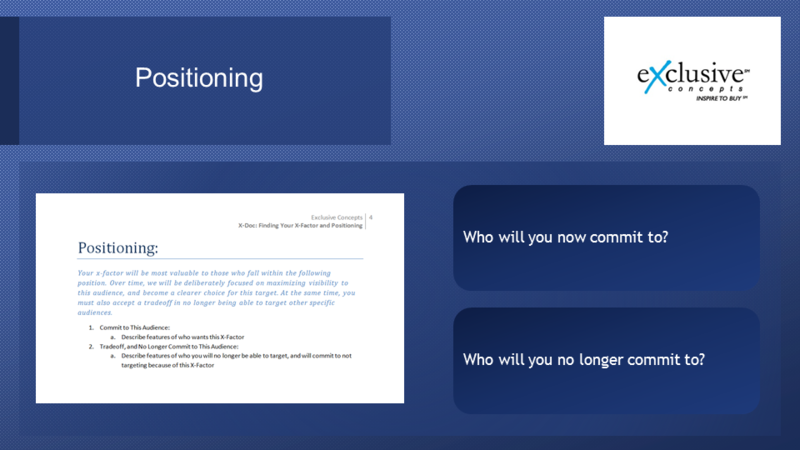 Positioning is incredibly critical for what you do. Now that you know your X factor you need to choose your audience very specifically, who will you commit to now and who will you no longer commit to? This is incredibly important. 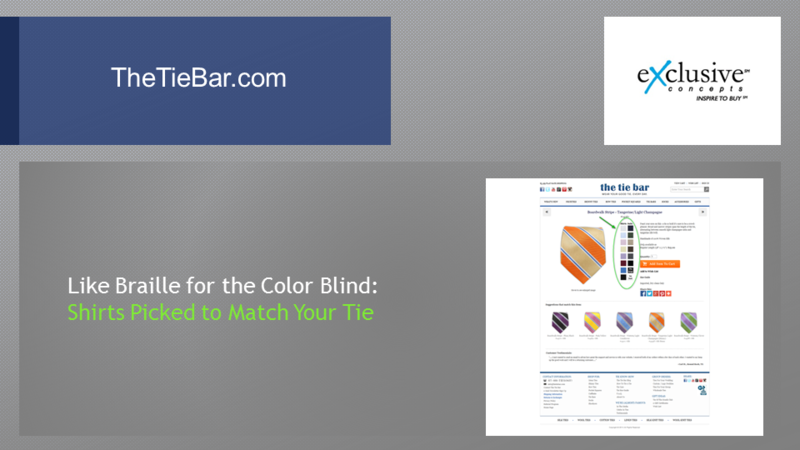 Let’s look at a few examples here, the TieBar. The TieBar targets a guy who’s trying to buy a tie that is not fashion savvy, has no idea what shirt to match this tie with, and they commit to this less trendy audience all the time while selling something that is hard to sell which is the tie, it’s for dressing up, for an audience who doesn’t like to dress up, who doesn’t know how to. When you buy your tie, it will tell you what colors you can match with. It’s a pretty cool concept and throughout the website, it is speaking to an audience that is a little less fashion mature. 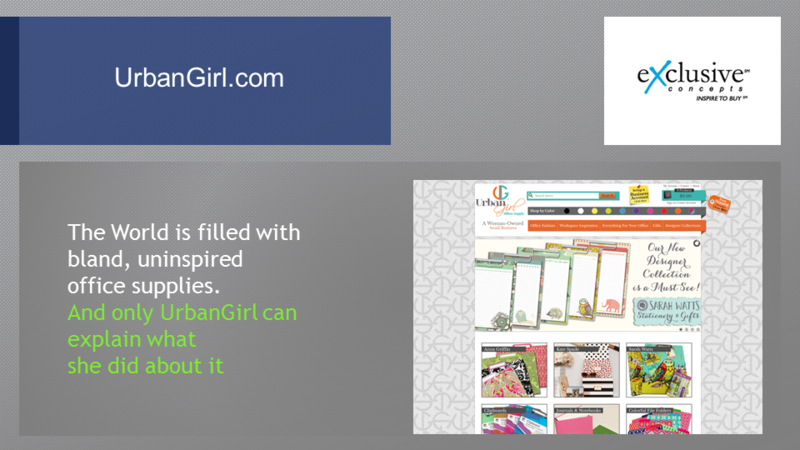 UrbanGirl.com set out to sell office supplies that were different and the people at UrbanGirl.com, UrbanGirl herself actually wrote in and gave up her story on how she came about creating Urban Girl. 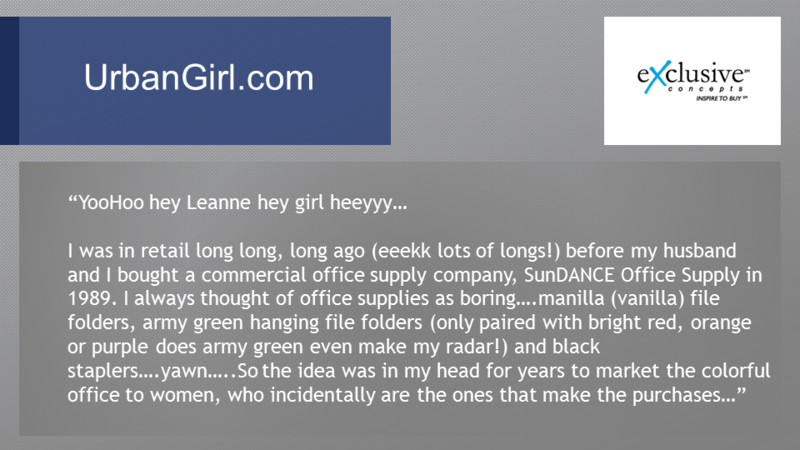 Now, Urban Girl wrote to one of our executive assistants, Leanne, an amazing, amazing email. “YooHoo. Hey, Leanne, Hey, girl heeyyy. I was in retail long, long, long ago, eeekk lots of longs, before my husband and I brought a commercial office supply company, SunDANCE Office Supply in 1989. I always thought of office supplies as boring … manila vanilla file folders, army in green hanging file folders, only paired with bright red, orange or purple, does army green even make my radar, and black staplers … yawn … So the idea was in my head for years to make a colorful office for women, who, incidentally, are the ones that make the purchases. 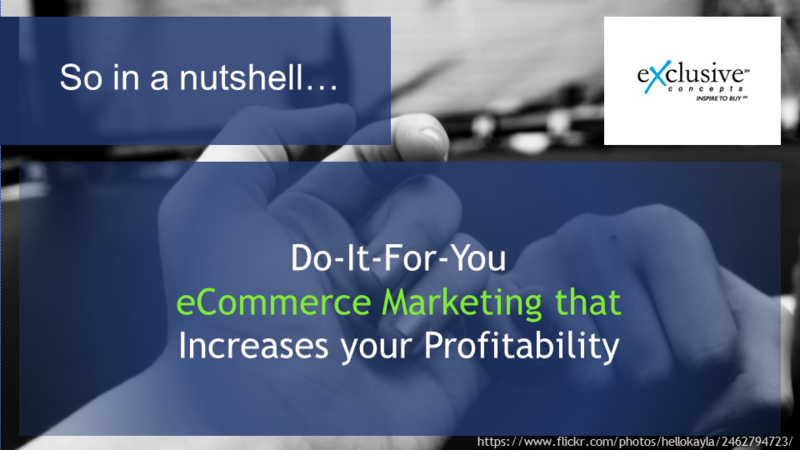 It was harder than I thought it would be… e-commerce is fiercely competitively. My advice to potentially e-commerce entrepreneurs … have a marketable idea, have a mod (tech savvy) squad and use a really good web marketing company … Surround yourself with people that are better than you! Embrace the word change! And, be prepared to expand your vocabulary … search engine optimization, pay for clicks or pay for click, conversions, organic searches, site speed, dynamic remarketing, meta data, bots crawling and my favorite … canonicalize!” That was Dyan Condry, Ms. UrbanGirl.com. When you’re choosing your market, you want to be careful of who you’re targeting and be cognizant of it. 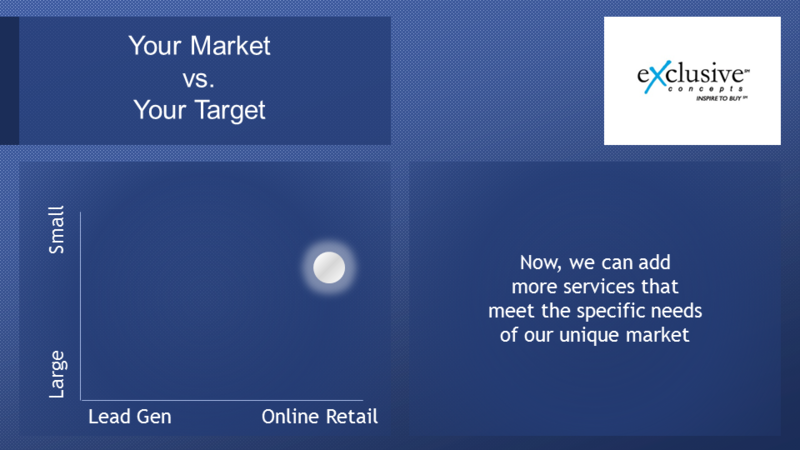 So far, our market, we target mid to large sizes only online retail, now we can add more services then meet the specific needs of our unique market. Similarly if you went from just being a company that sold any type of electronic to being one that sold only PCs to a market that is somewhere between high-end and hobbyist, here are the type of things you might want to do., add more high-end products, add more hobbyist content because hobbyist want deep content. Invest in more conventions where these hobbyists might be, create more geeky viral content that hobbyists, enthusiasts would promote. 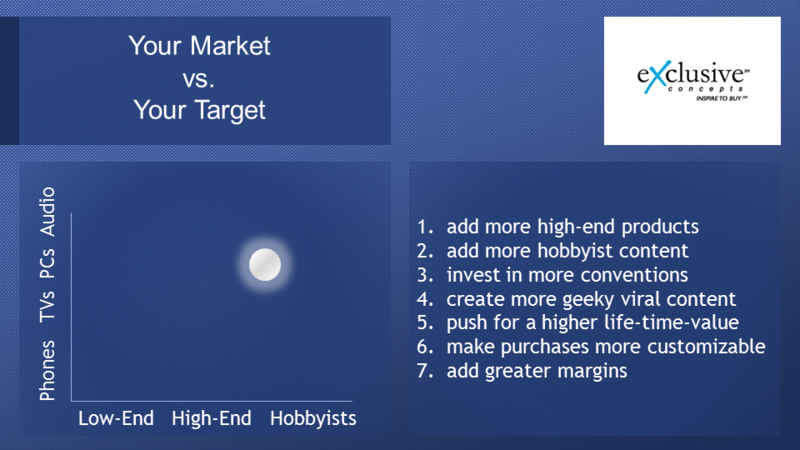 Push for a higher life-time-value because this is something that these hobbyists would buy over and over again. Make purchases more customizable. They have the money; it’s high-end and they want the most elaborate customizable concept. Because you’re creating this experience, it adds greater margins. The worst thing you can do, Michael Porter says this. He’s a professor at Harvard. He says, “If you get into a price war that is a war of attrition, do what you can to not have to fight over price. “ Now you’ve done all of this, your competitive analysis, your SWOT analysis, your positioning mapping, now set yourself some SMART Initiatives to embrace that X factor. 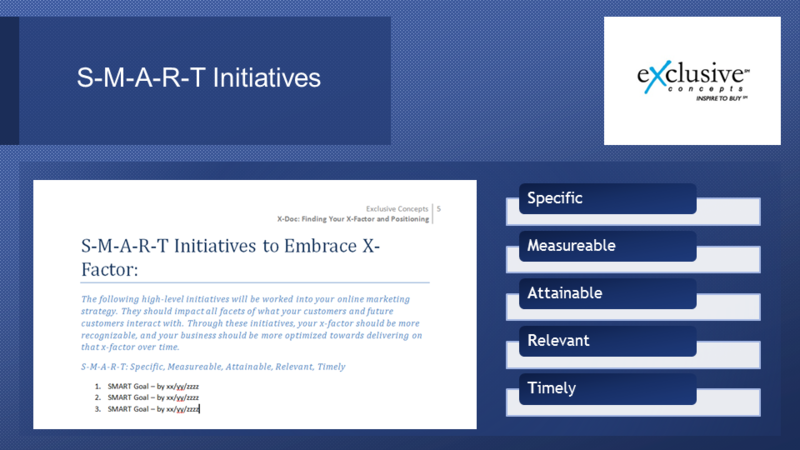 Smart Initiatives should be Specific, Measurable, Attainable, Relevant and Timely, SMART. When you’re choosing this, focus on what you will do to track people, SEO, PPC, PLA. 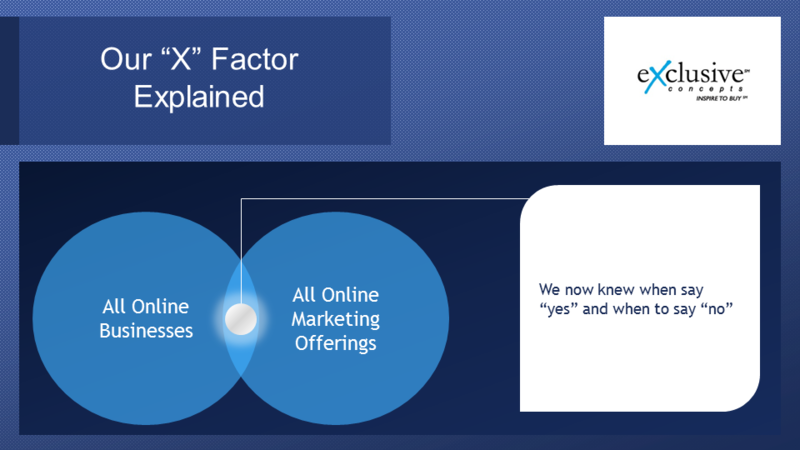 Focus on your conversion optimization, how will you change the user experience to be in line with this new X factor? Focus on your database or email and your social, how will your message your X factor and how will you harness past customers towards that? Focus on the backend. If you’re going to do something that utilizes your internal sales people, your account managers, your vendors, think about that. Make sure you focus on your vendors as much as you can and your loyalist. All of it should come together and make your X factor stronger. 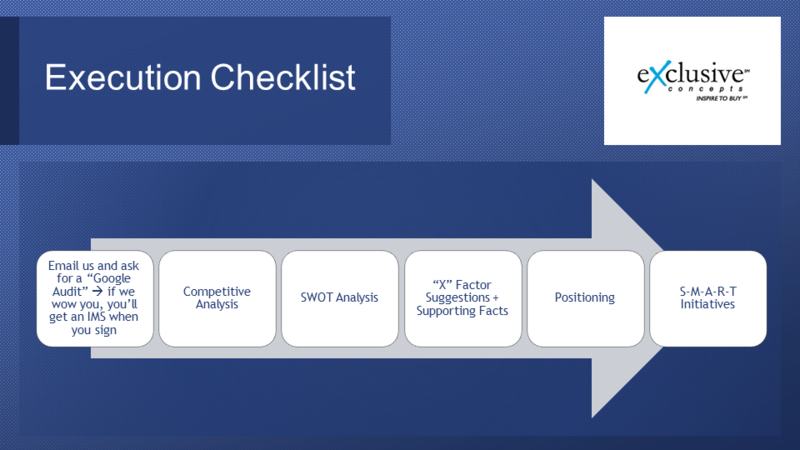 Quick hover of execution checklist, email us and ask us for a Google Audit because if we can help you make more money on PPC and Google Shopping or SEO or conversion or email you’re going to get an IMS for free and they can help your with your X factor. It’s a win, win, win. If you’re doing this on your own, start with your competitor analysis then your SWOT, then you X factor suggestions and your supporting facts, make sure you follow the rules. Choose your positioning. Who are you targeting, who are you not targeting? Then create your SMART Initiatives and that’s it. If you were there for the live webinars there would be Q&A right now but since you’re watching this in the recorded version, our OnDemand version I hope you enjoyed it. This is Nick Rajpal signing out, nrajpal@exclusiveconcepts, @nik_rajpal if you want to follow me on Twitter. We hope we connected to you soon. 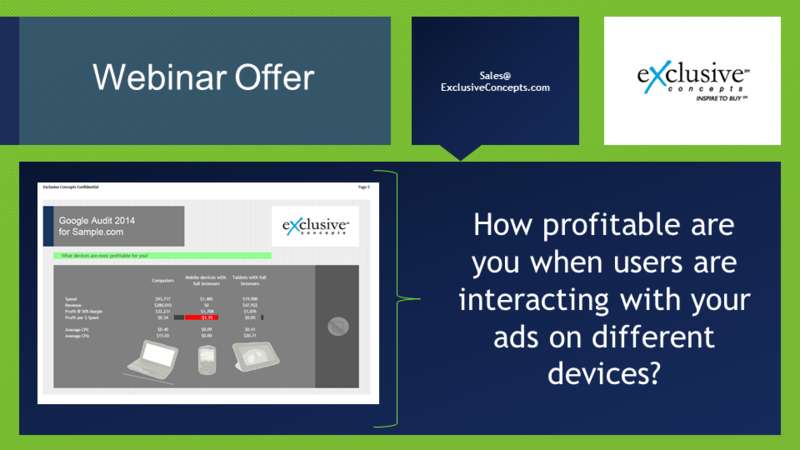 Check out the other webinars we have live as well, our Exclusive Concepts profile on YouTube has a series of other webinars from this year. We’ll be getting many more out during the rest of the year. Thanks folks.